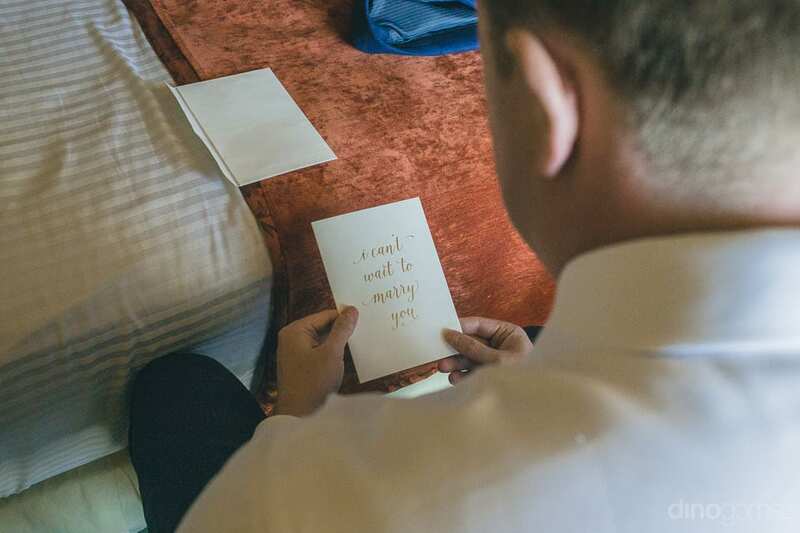 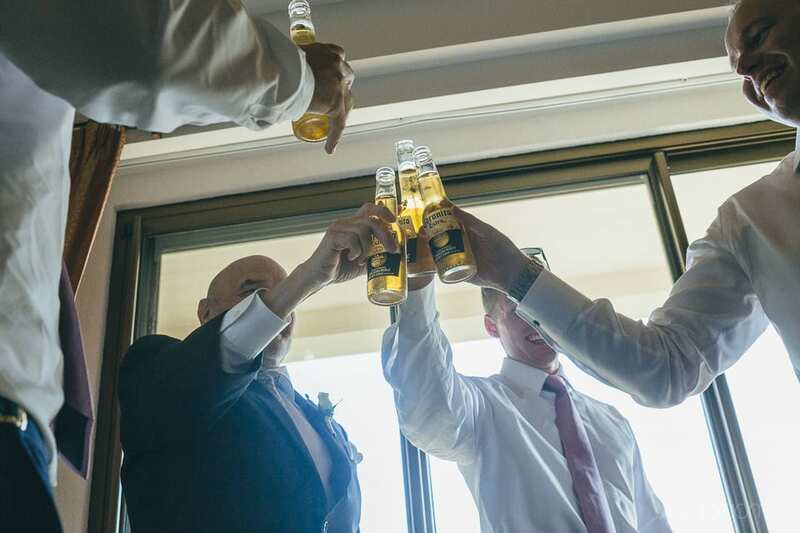 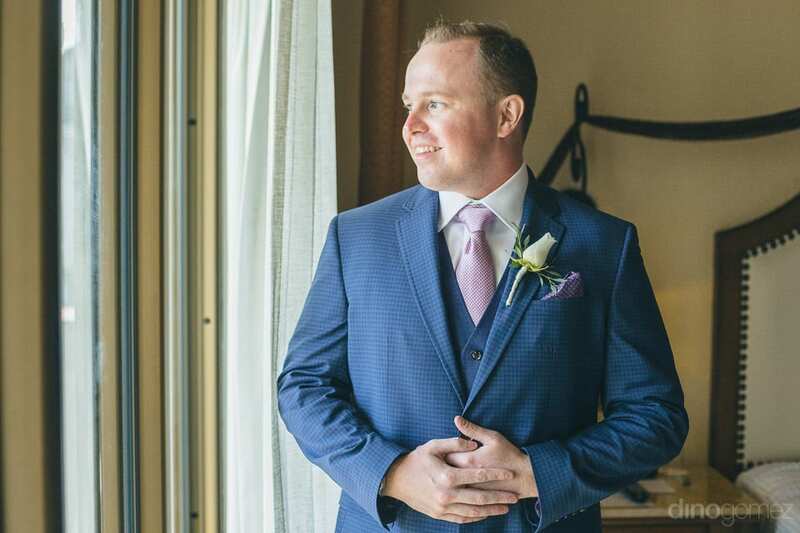 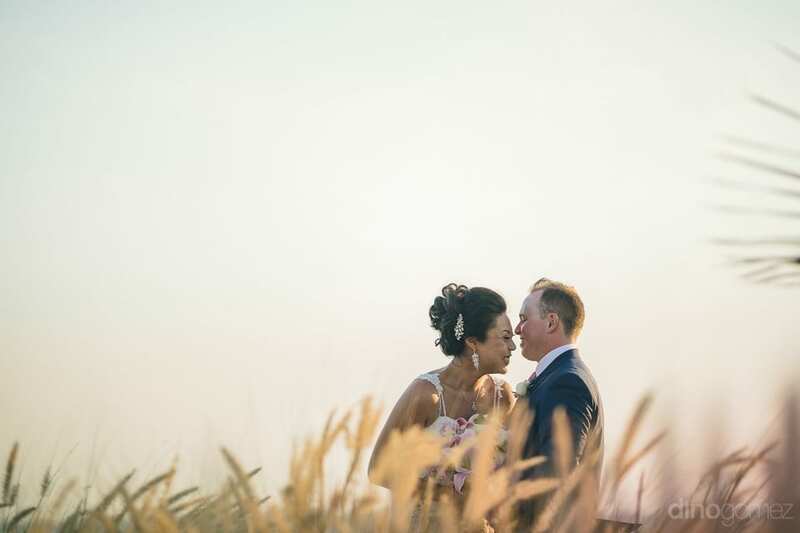 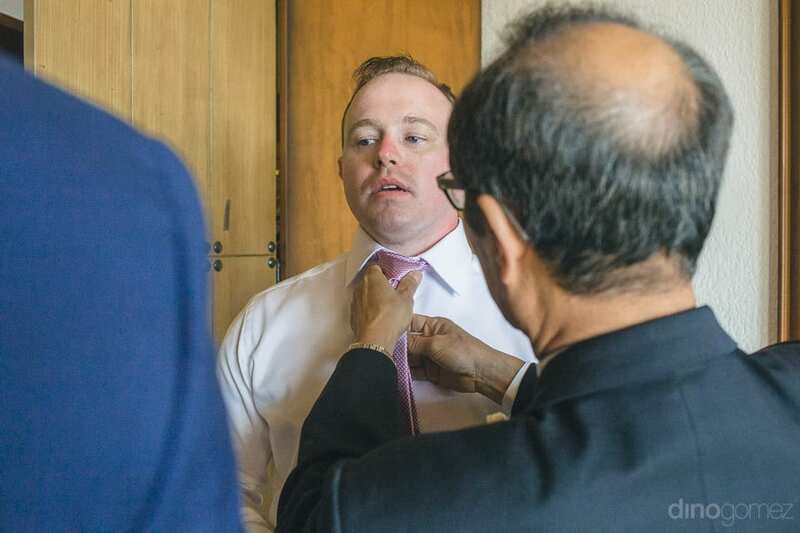 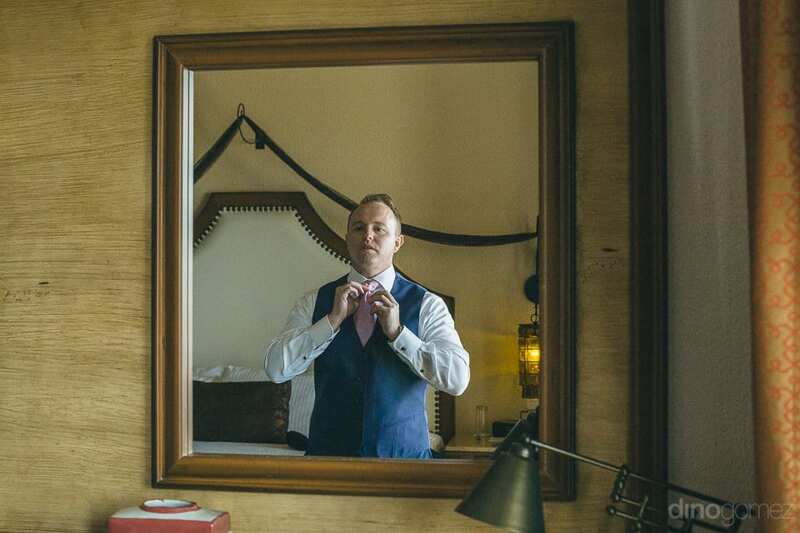 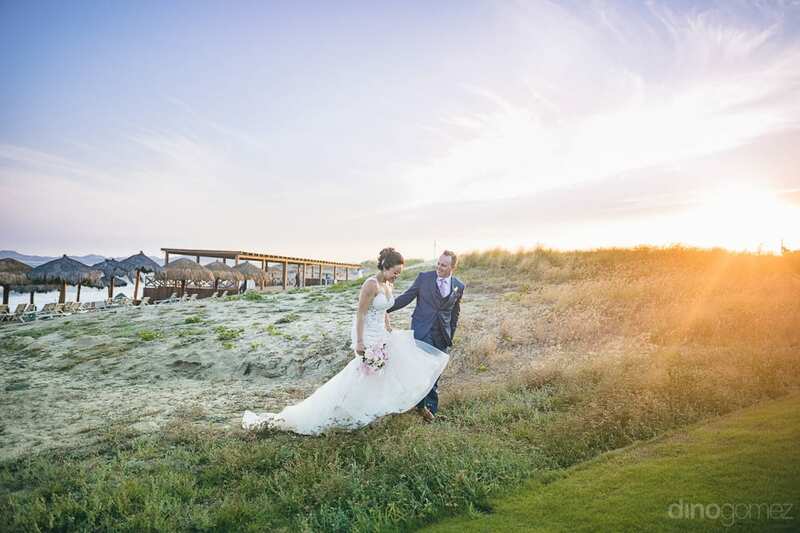 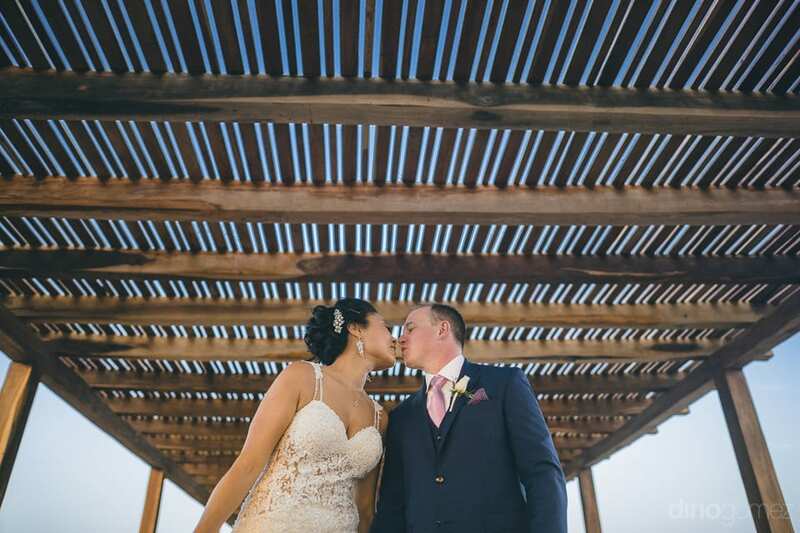 Enjoy the Preview from Jay & Drew’s lovely wedding! 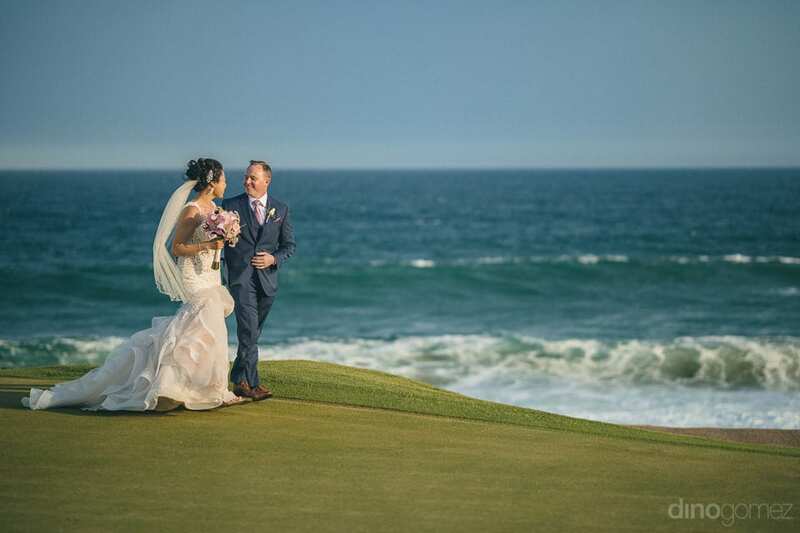 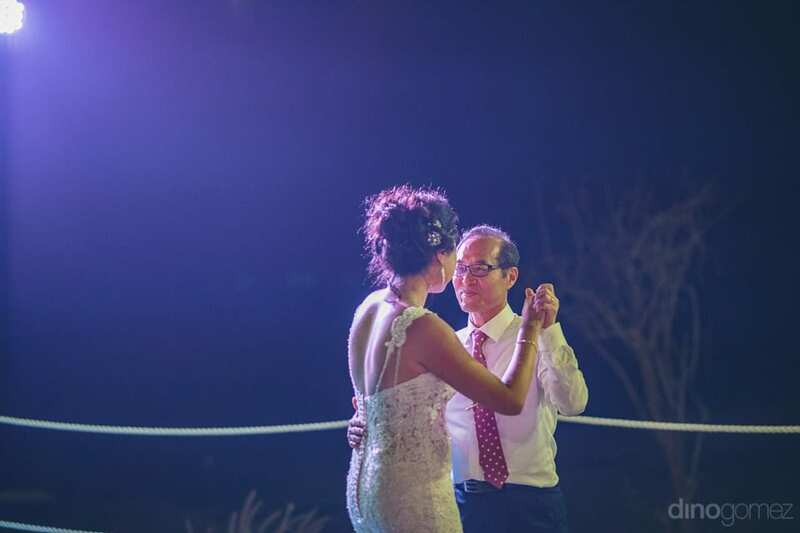 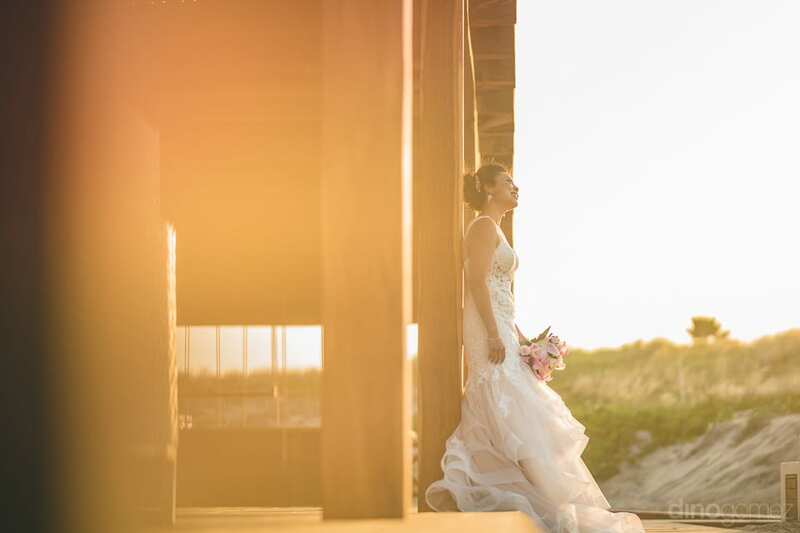 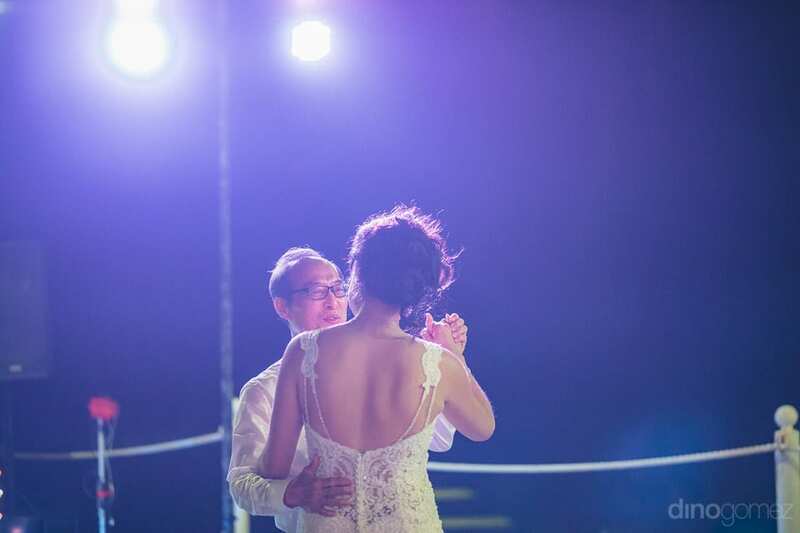 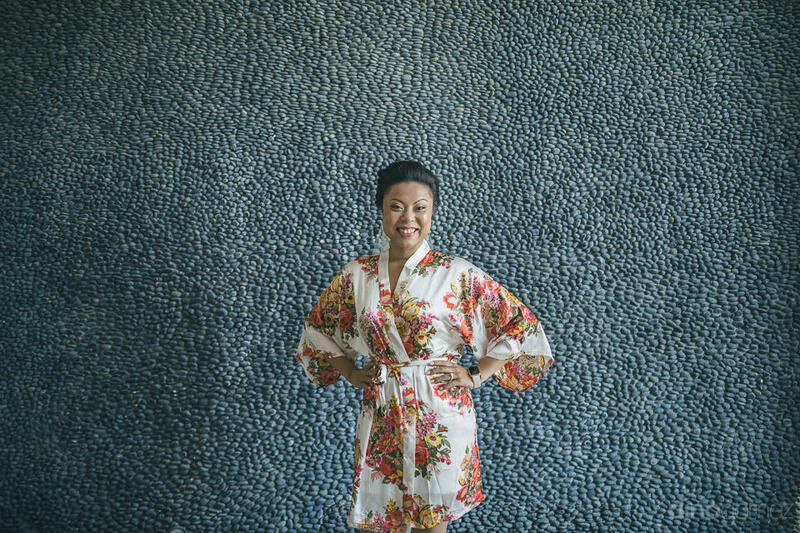 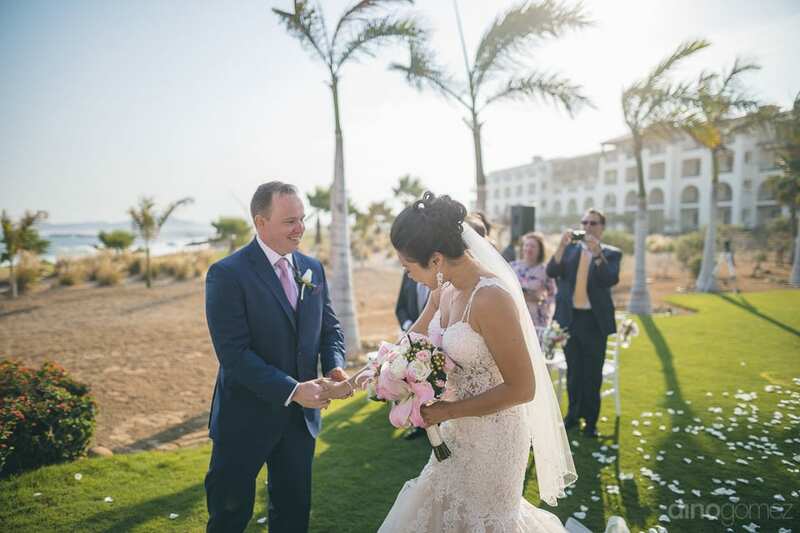 Wedding Coordinator: Leslie Chaves from Secrets Puerto Los Cabos! 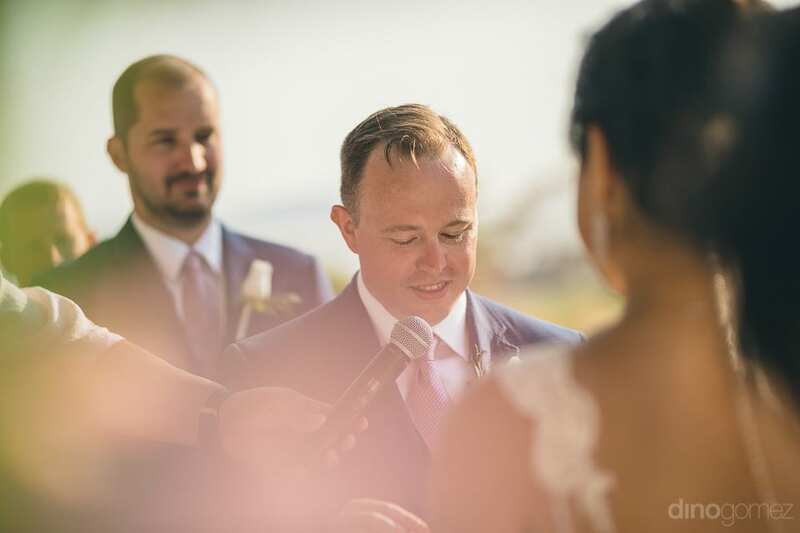 Officiant: Minister Marco. 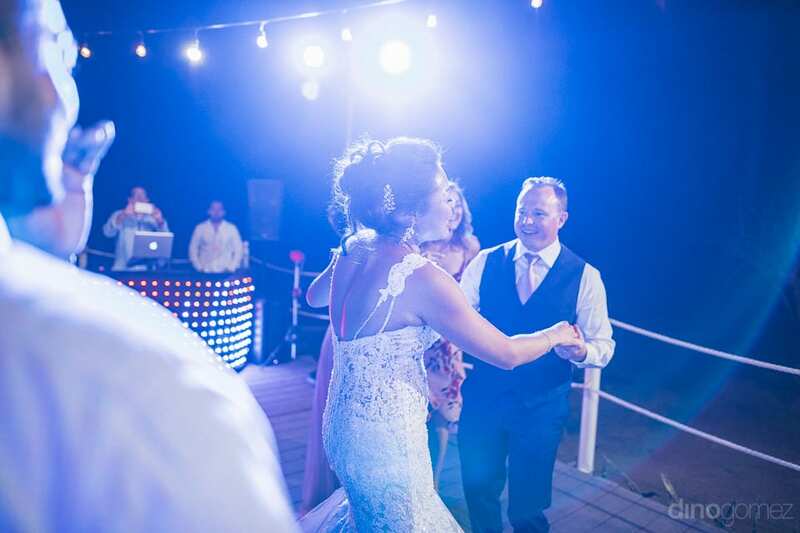 Music/DJ: Encore Events. 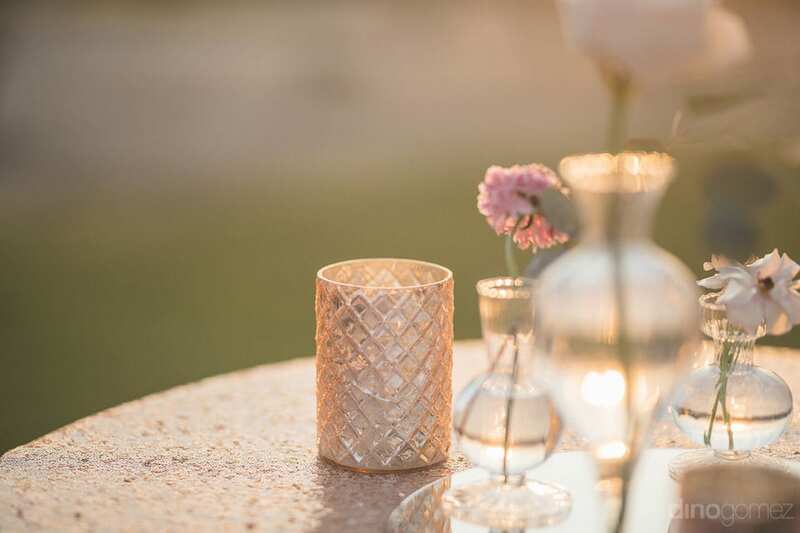 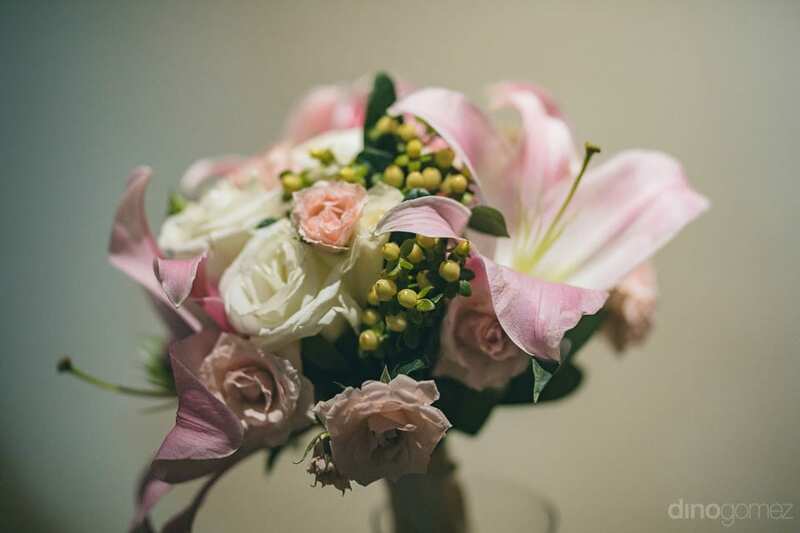 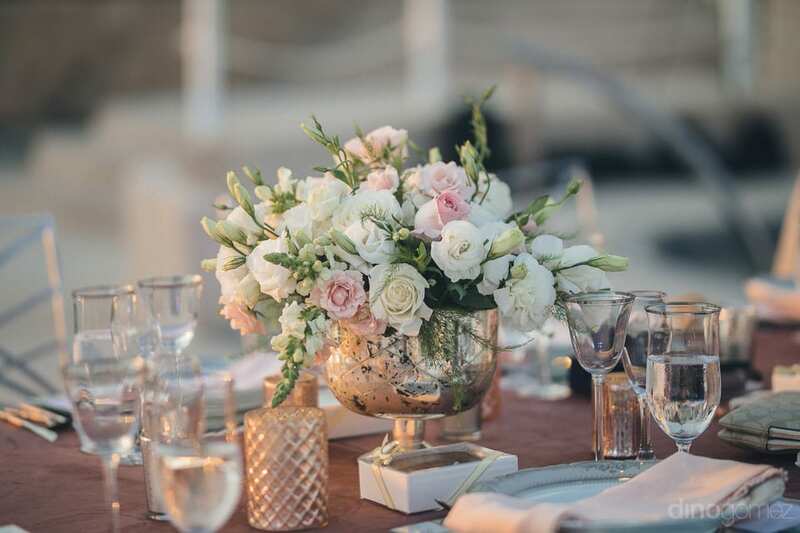 Flowers & Decor: Flowers & Events Los Cabos. 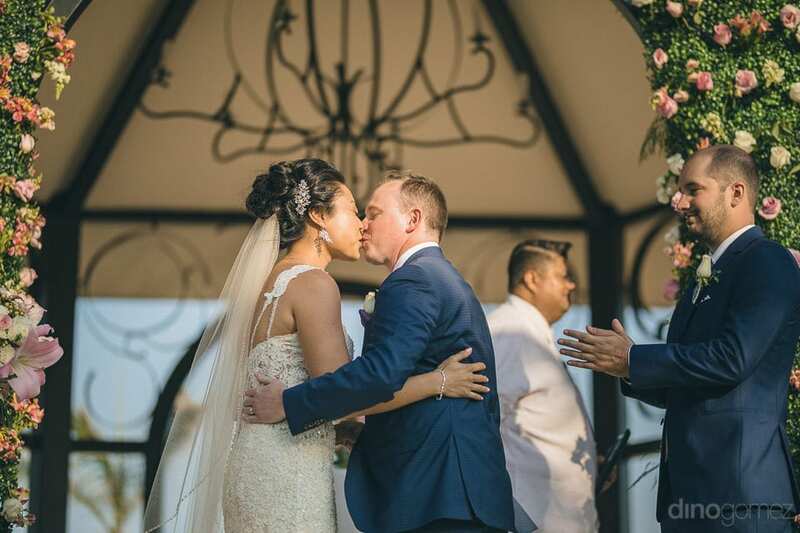 Stories do come true, as it did for this couple. 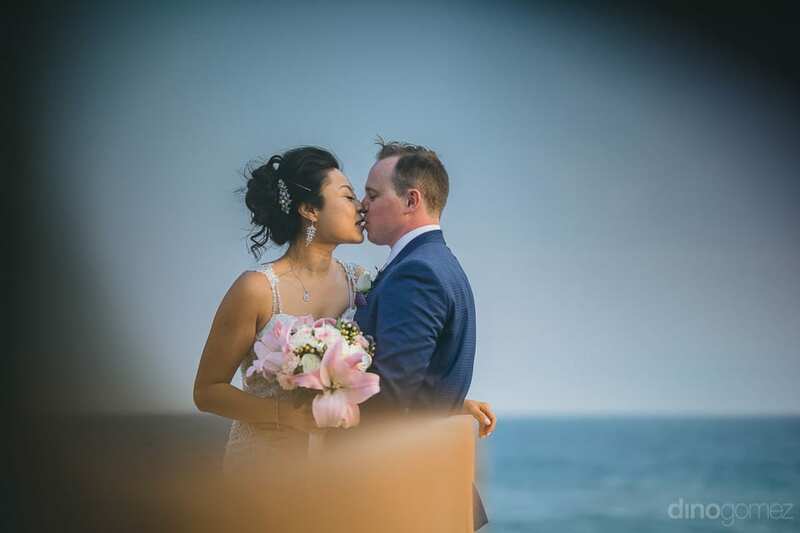 Theirs is a perfect typical Hollywood love story; a beautiful city girl and a handsome country boy, collide with each other in a new unknown place at work, get along and fall in love. 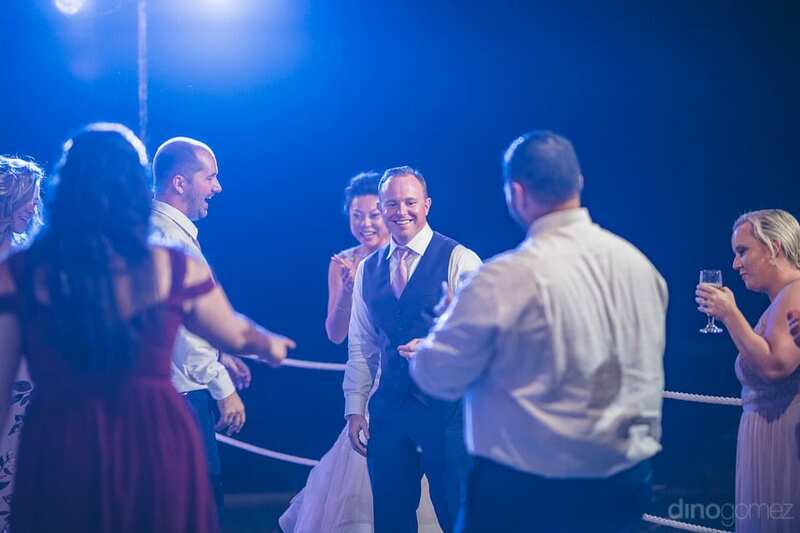 So are Jay and Drew. 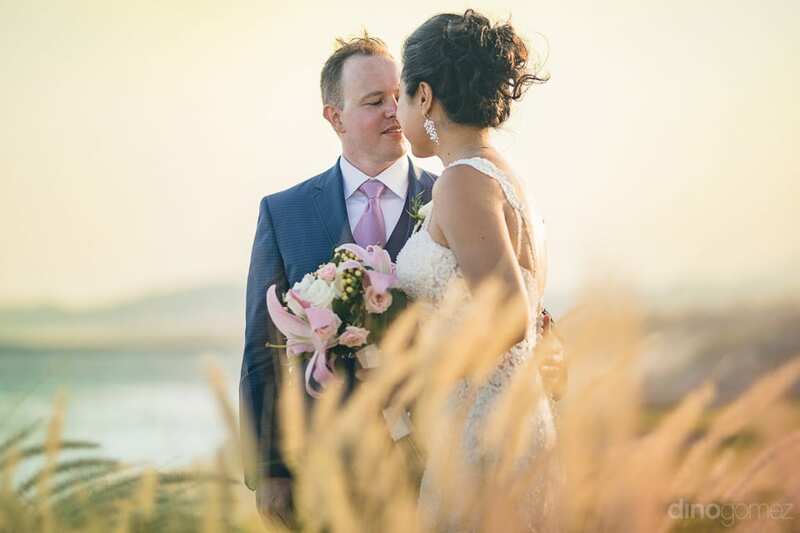 They both met at work at Hartford, Connecticut, where both of them were pursuing their first ever job, freshly getting out of college. 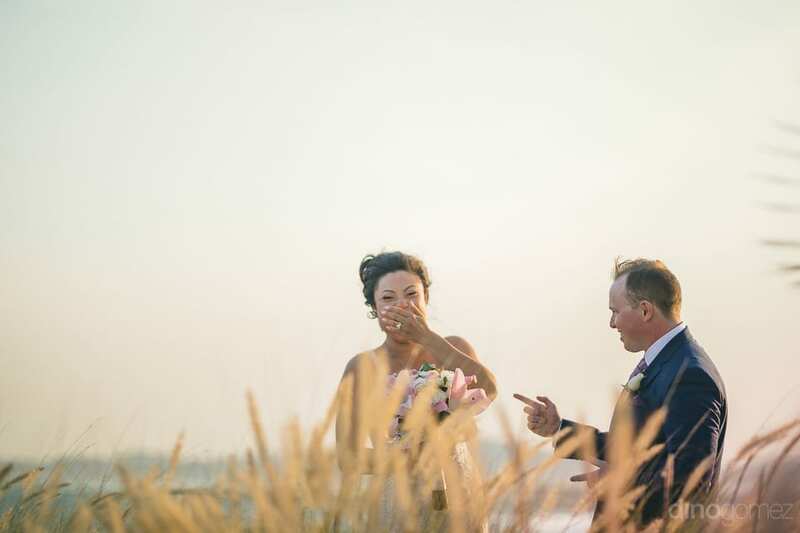 Drew, a countryboy from Pennyslvania, and Jay, a star studded city girl from New York came closer at work, got to know each other’s backgrounds, and fairly were able to appreciate each other. 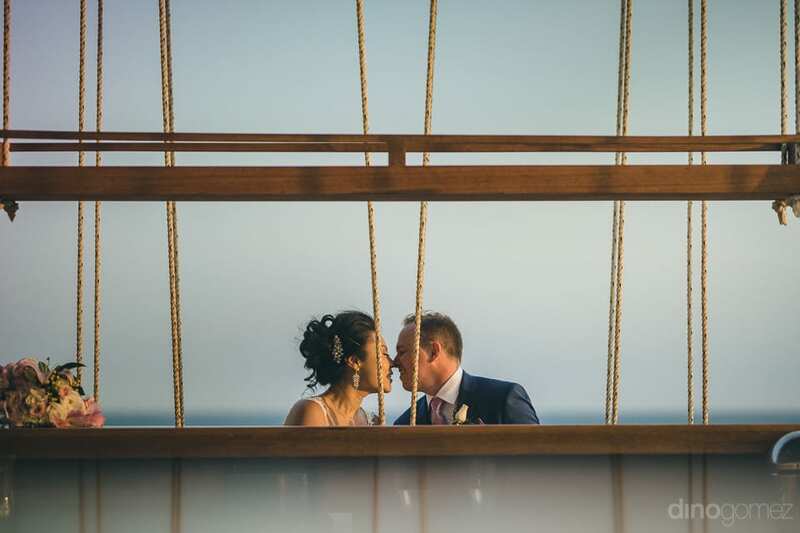 Such is love. 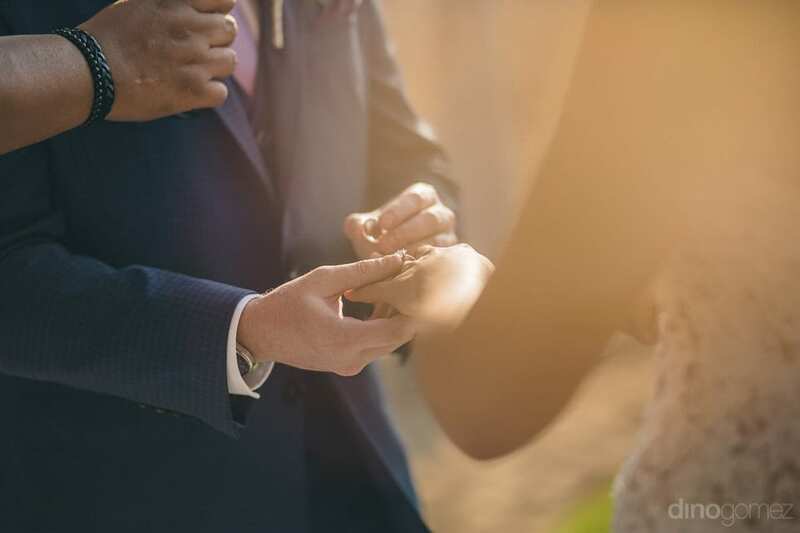 They dated for 6 long years before getting engaged and at present the lovely couple is residing in New Jersey. 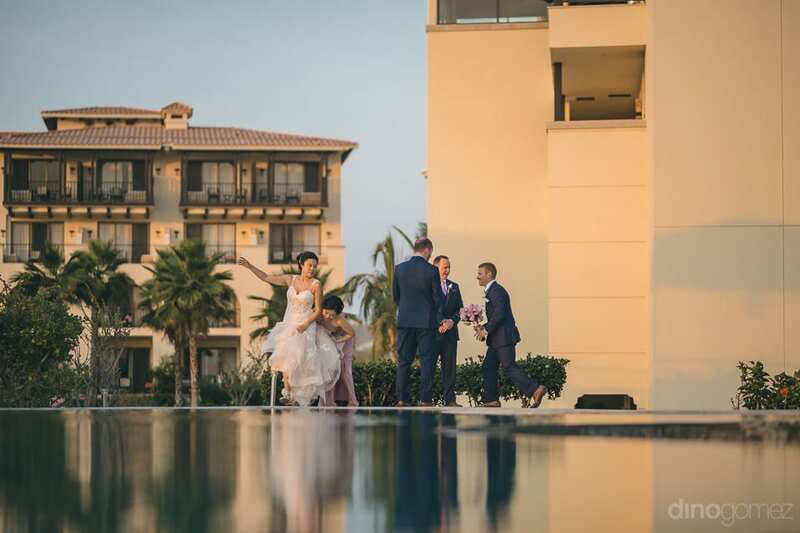 The couple decided to get married and wanted the best destination photographer in Mexico, Los Cabo to capture the moments of their wedding. 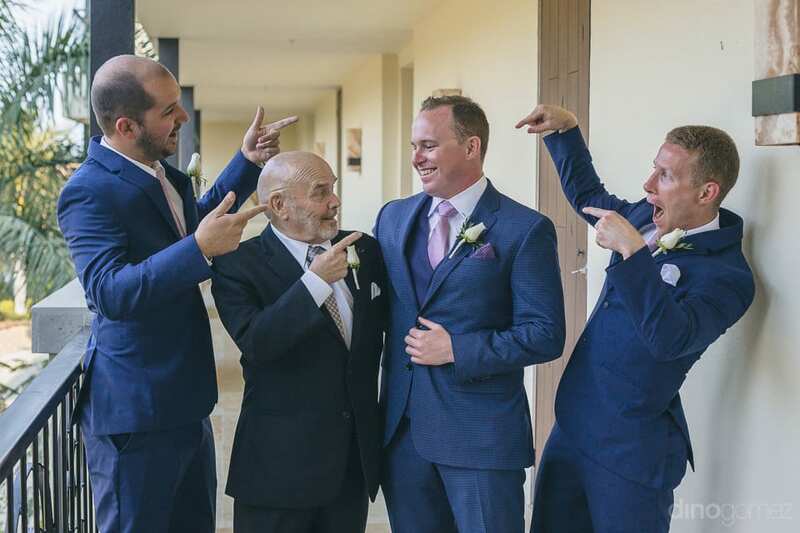 They both are extremely family oriented. 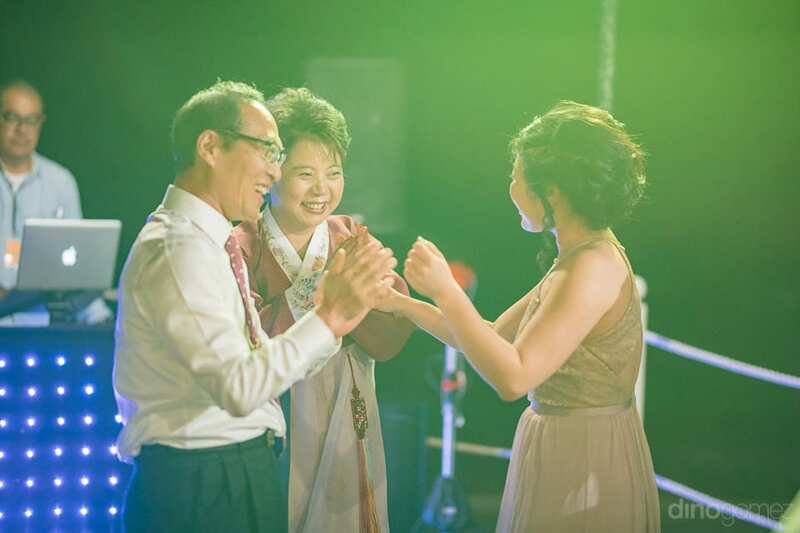 Their parents especially play a very important part in their lives. 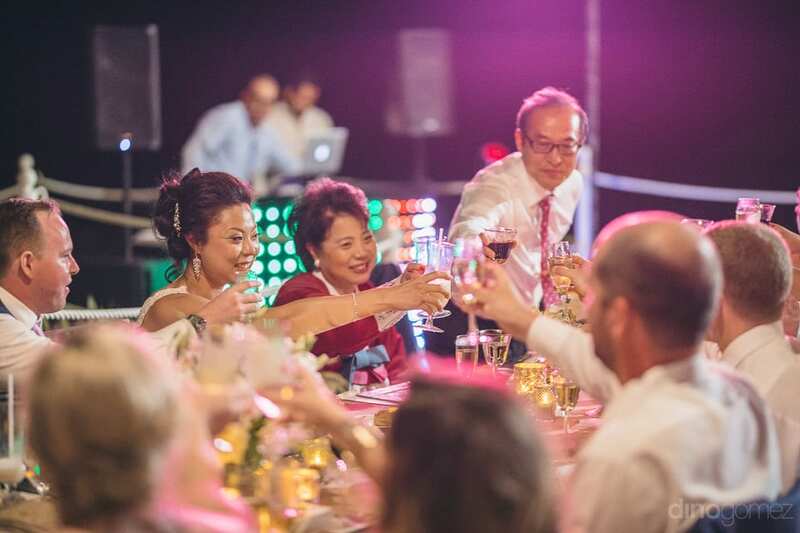 The couple likes to include them in every important occasion in their lives and spend time with them anytime they can. 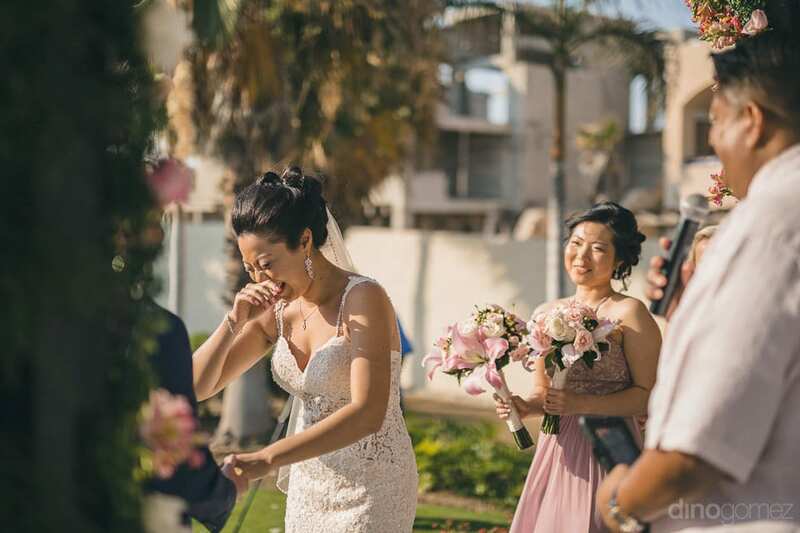 Their love for the family can be clearly seen during their wedding. 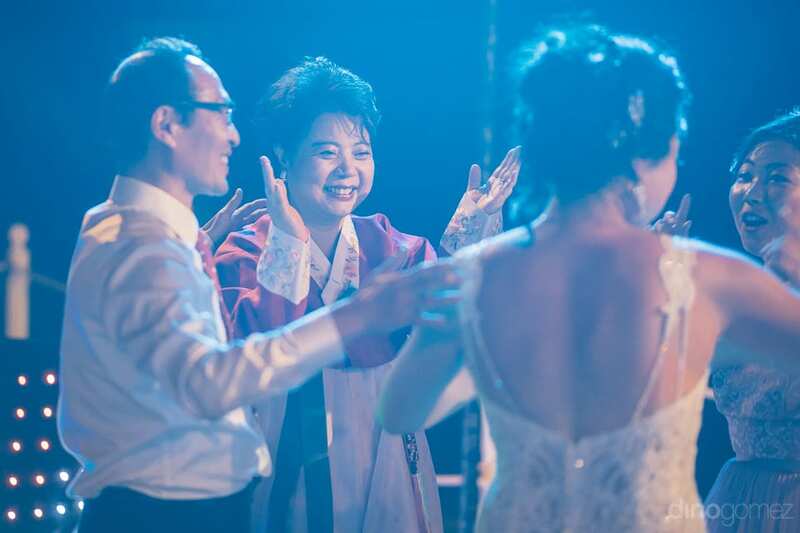 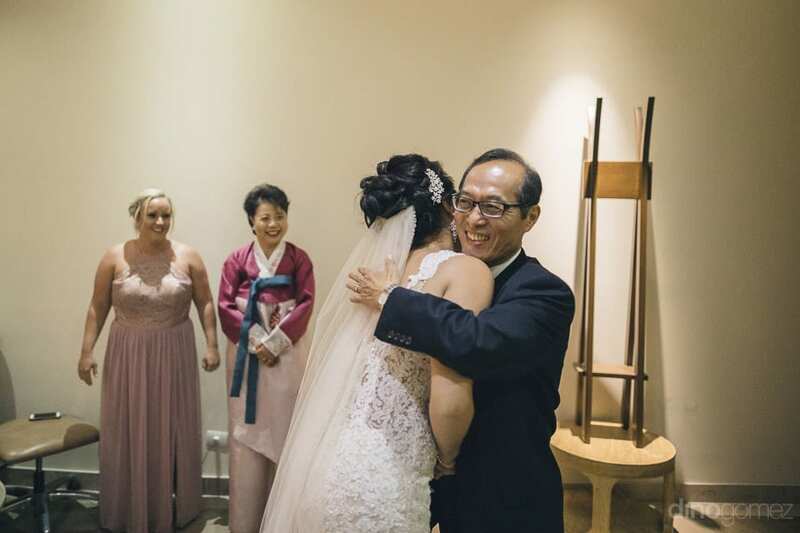 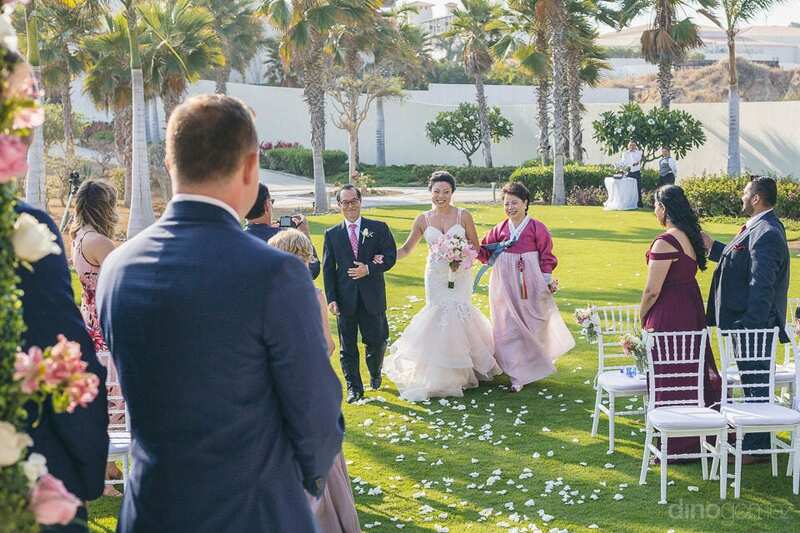 The couple had a very private wedding with just close family members as their wedding guests. 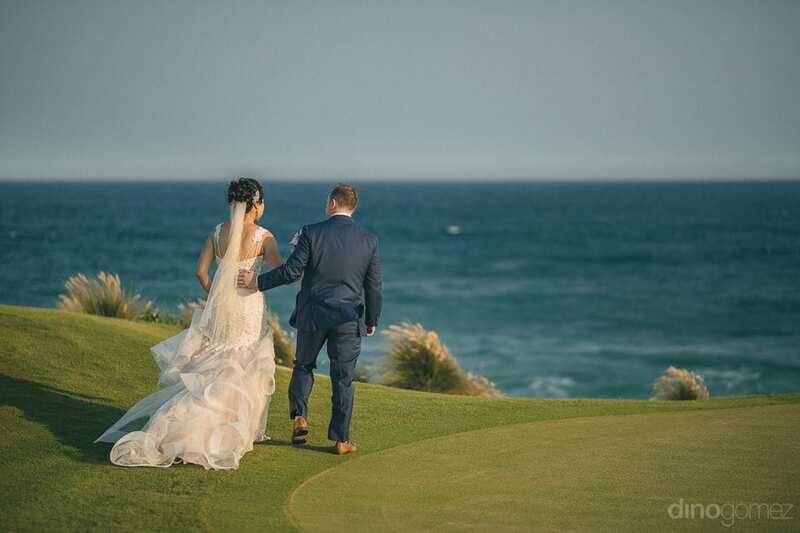 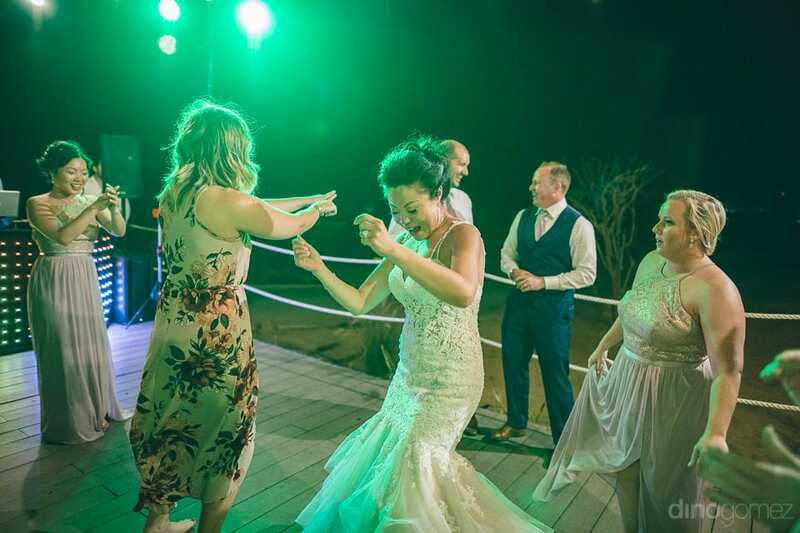 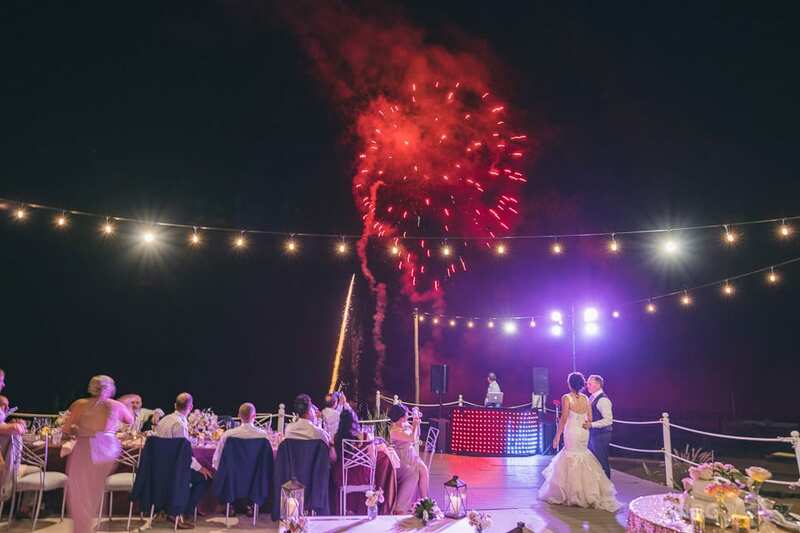 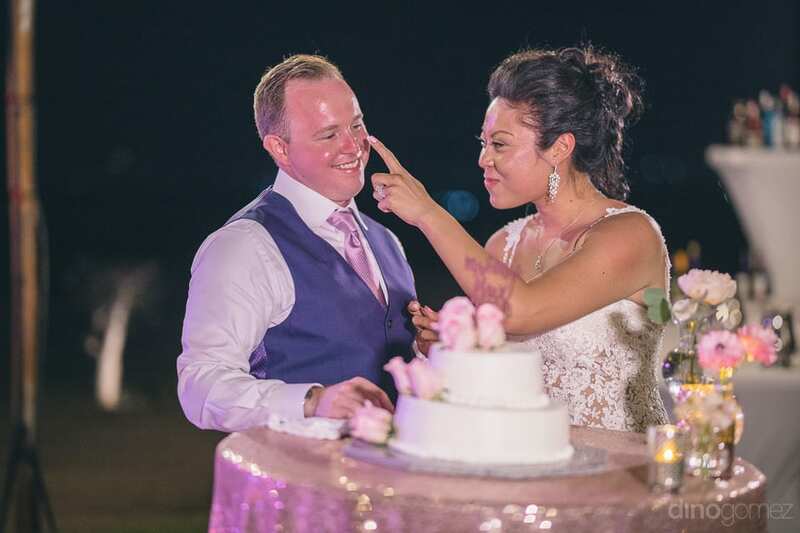 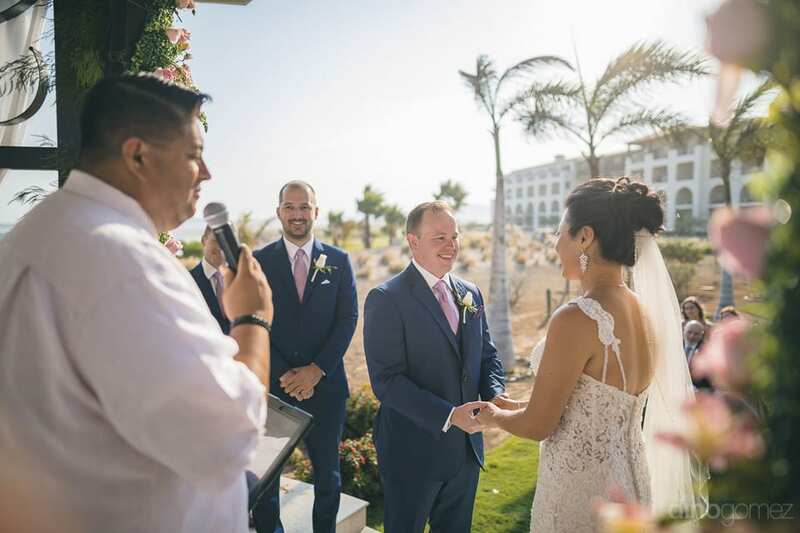 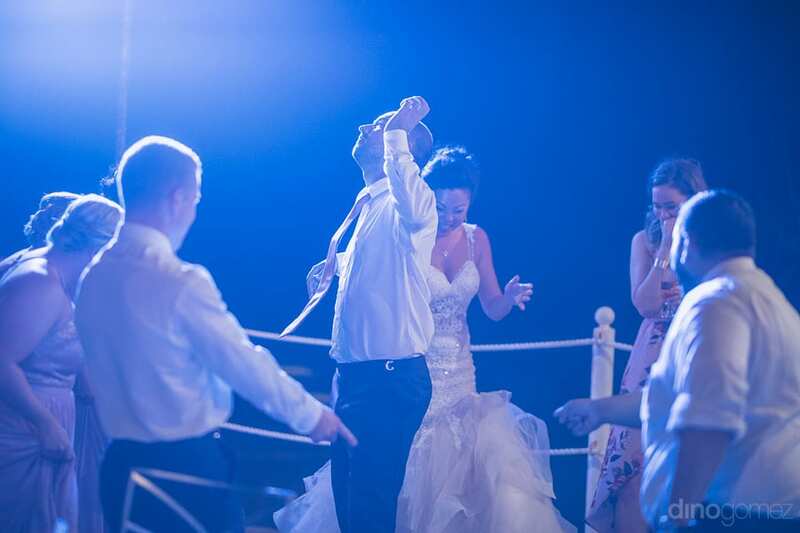 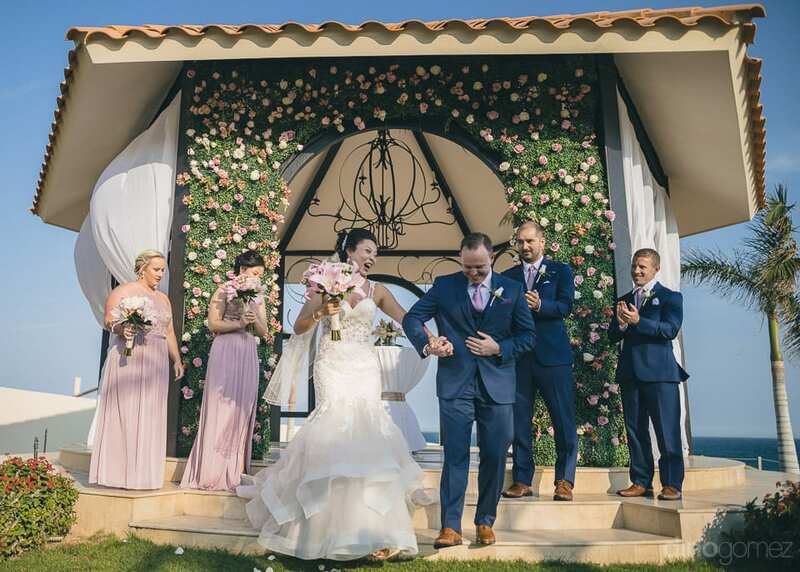 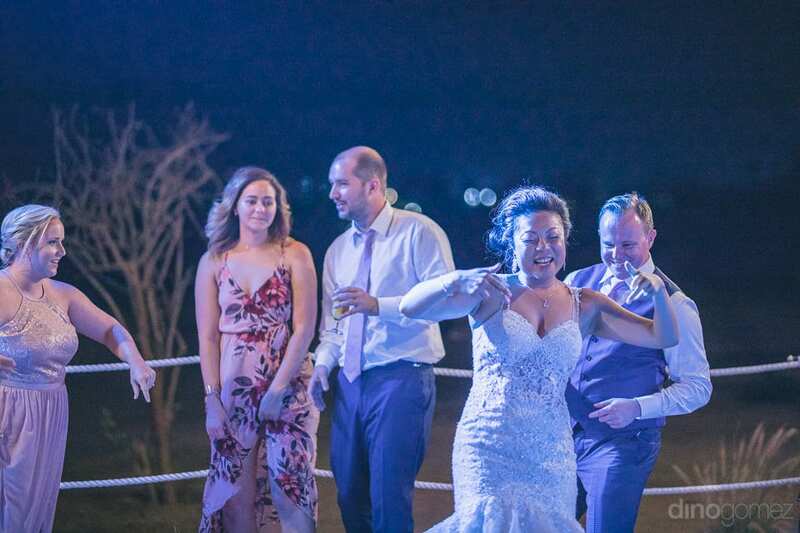 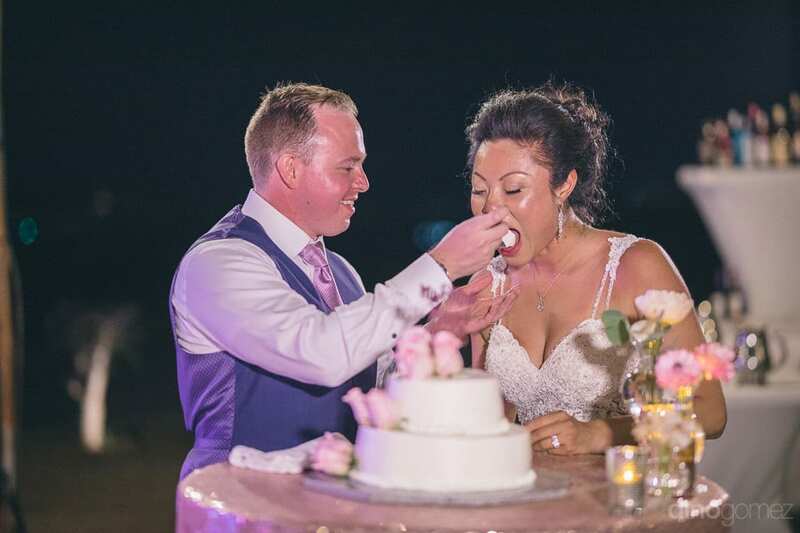 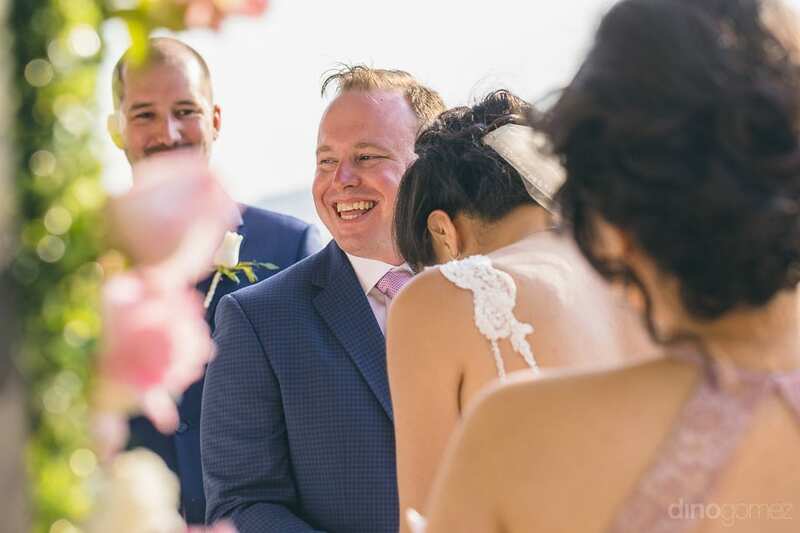 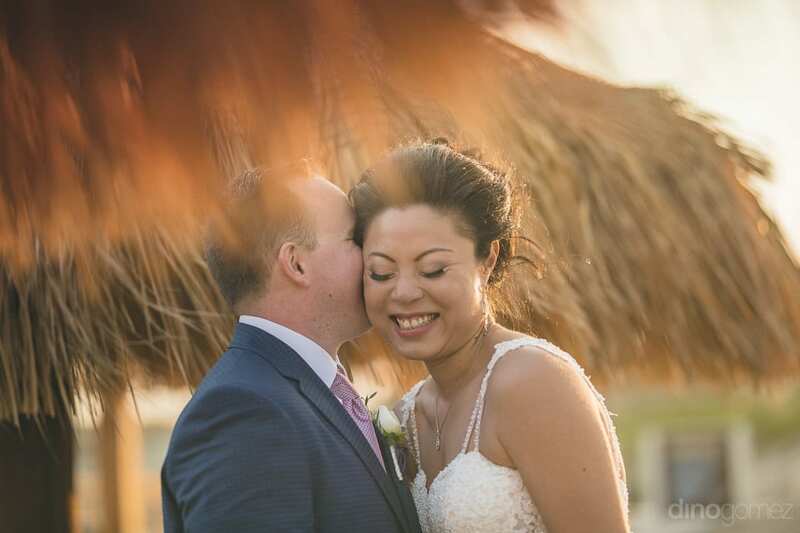 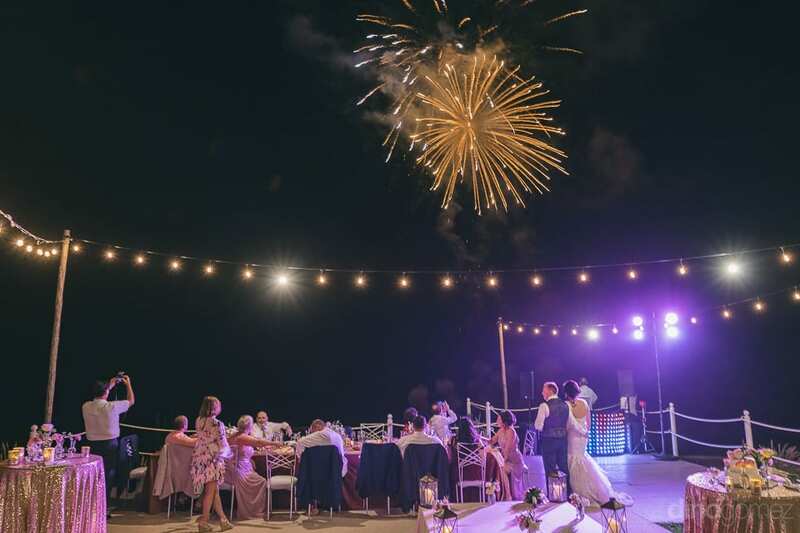 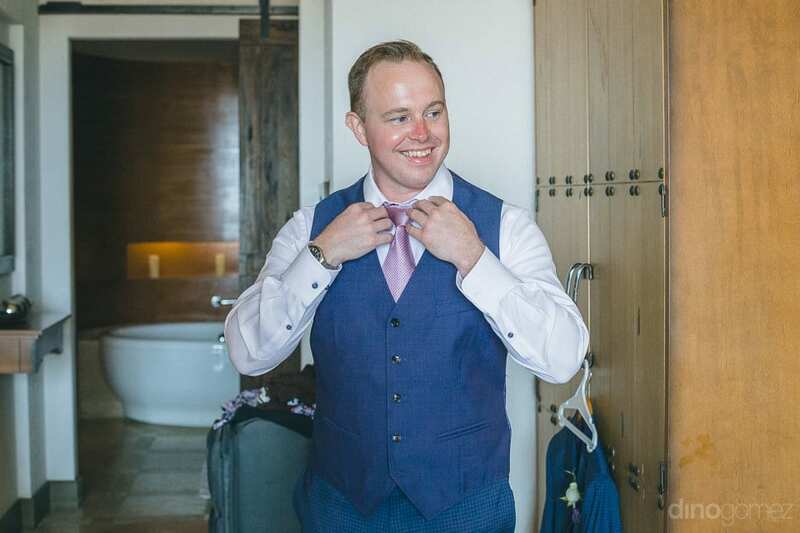 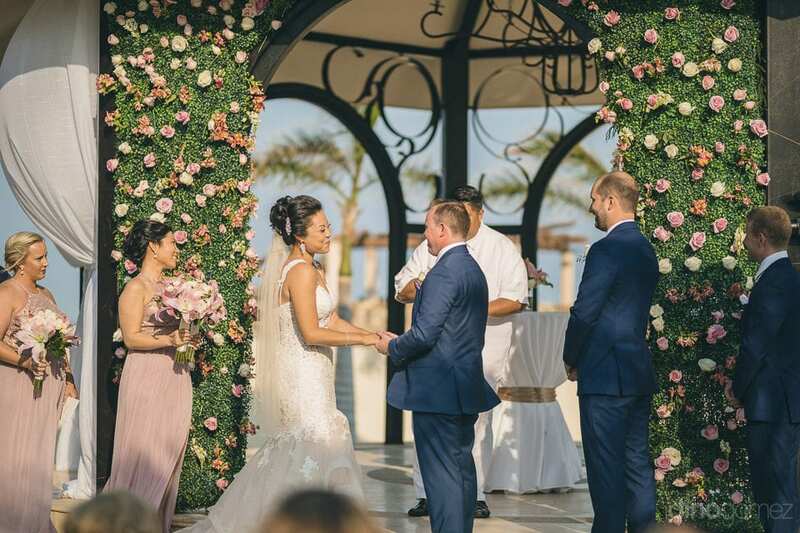 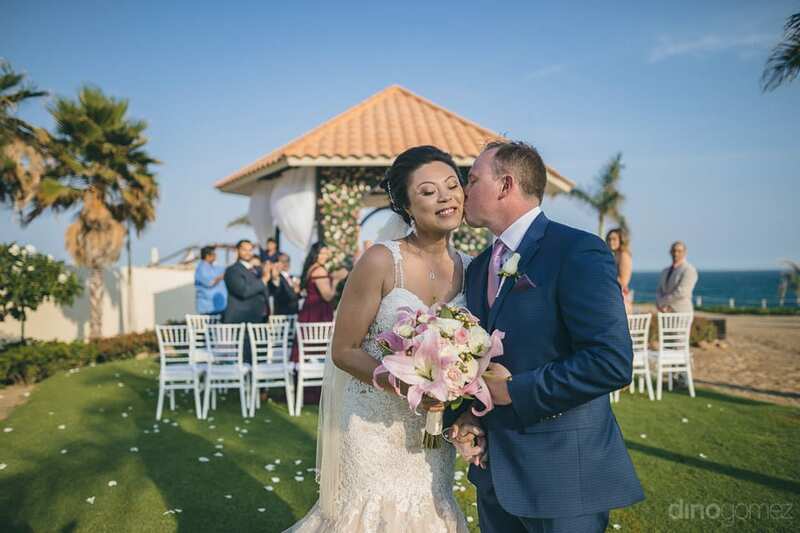 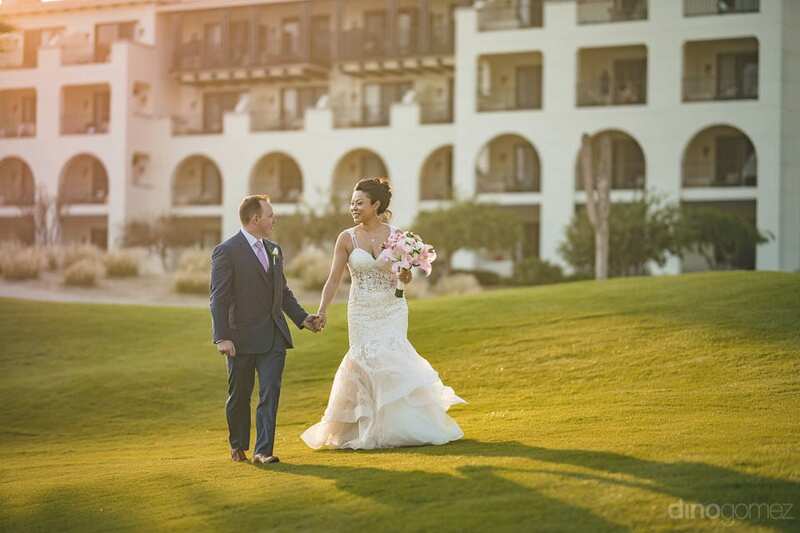 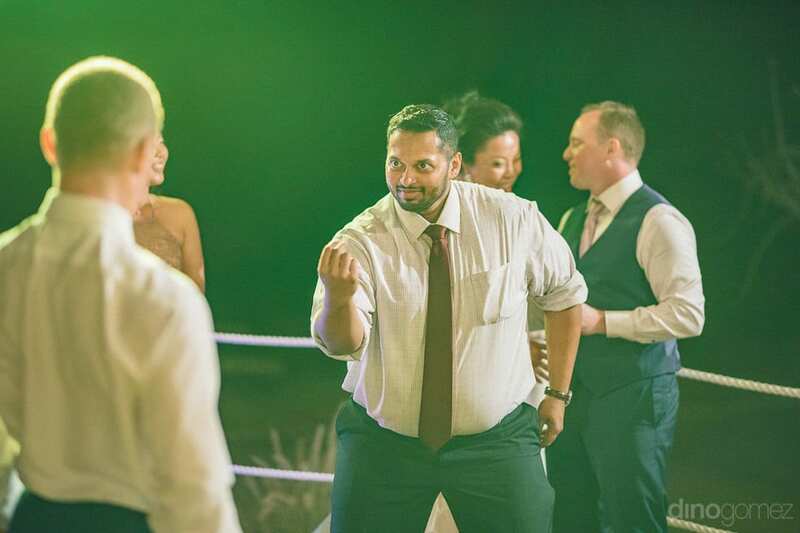 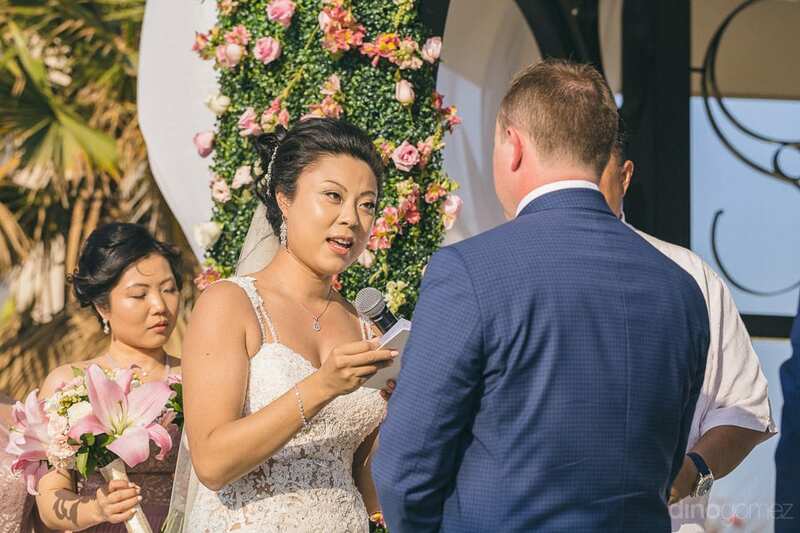 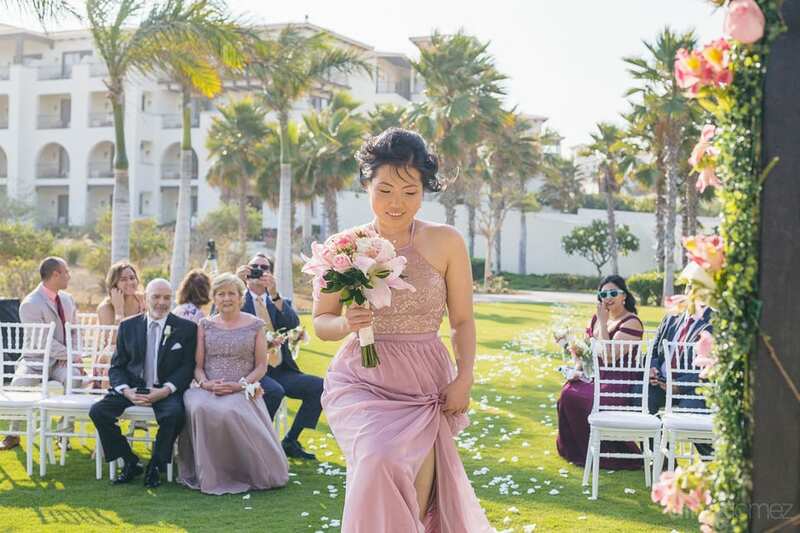 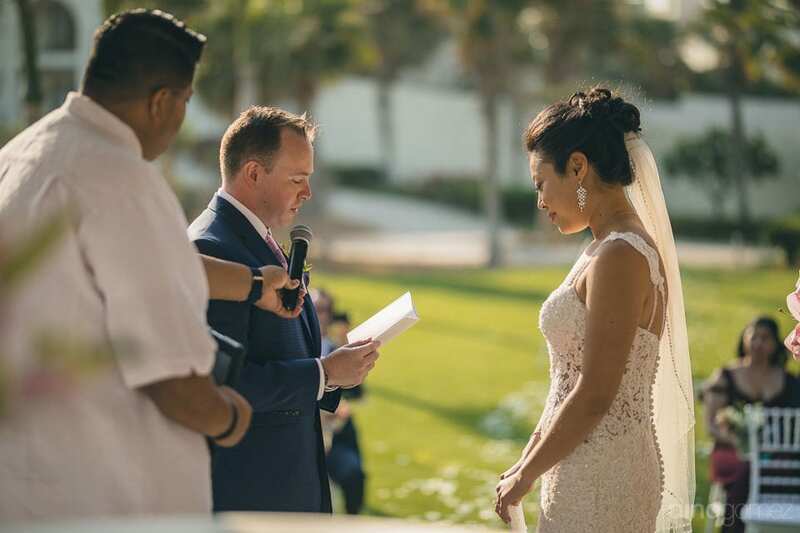 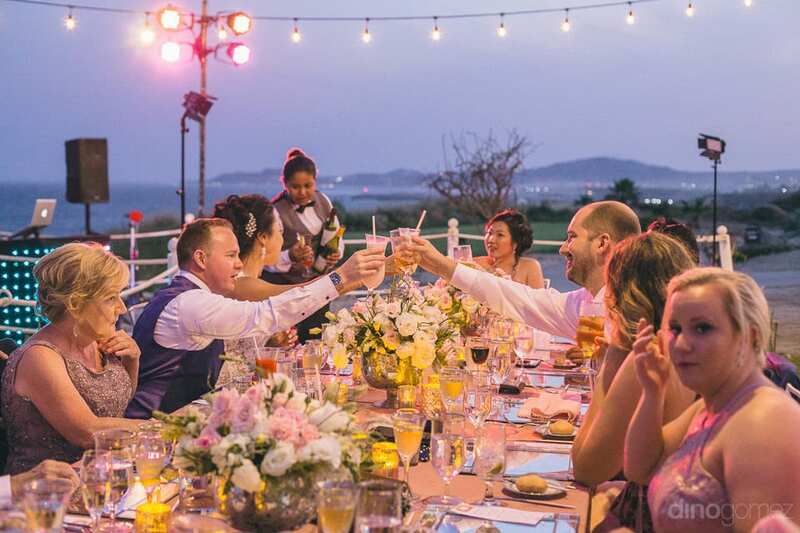 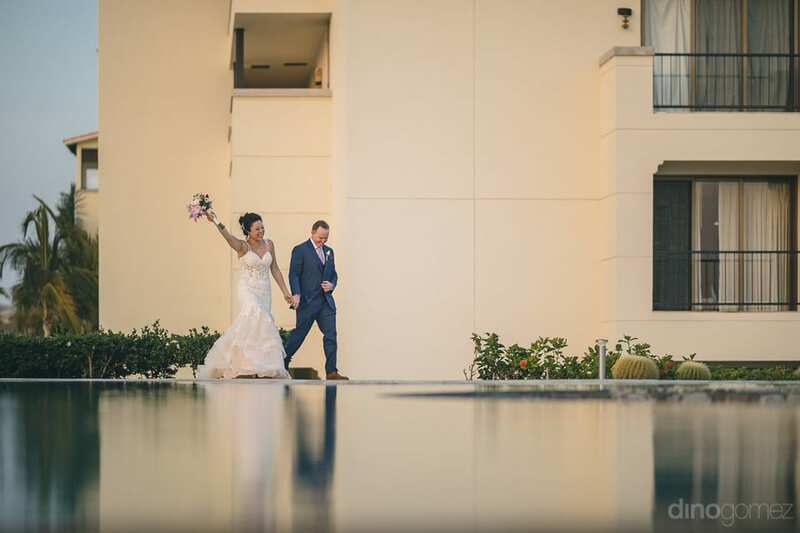 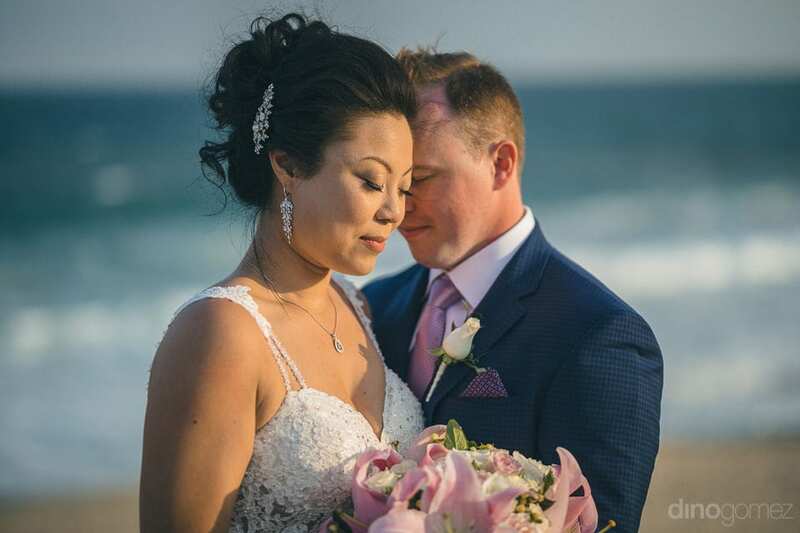 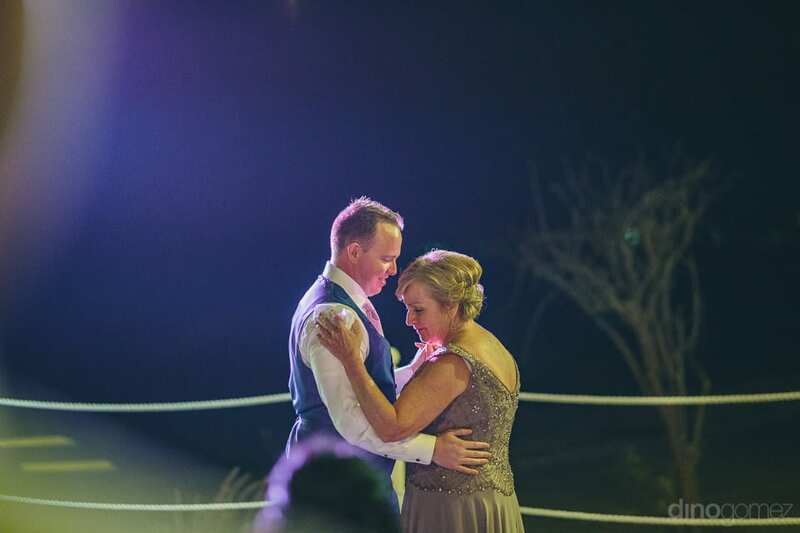 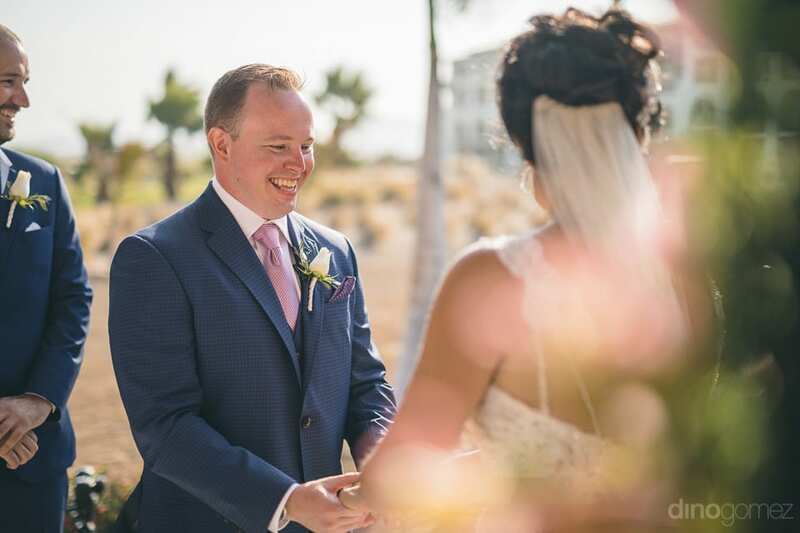 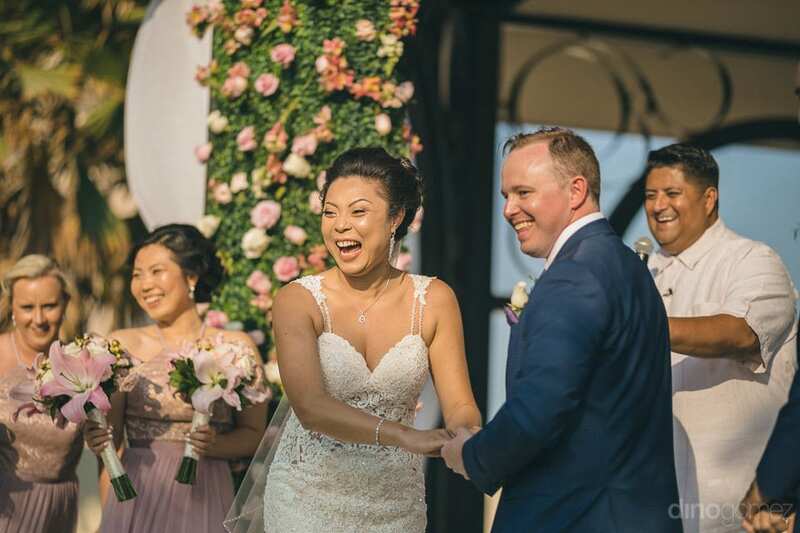 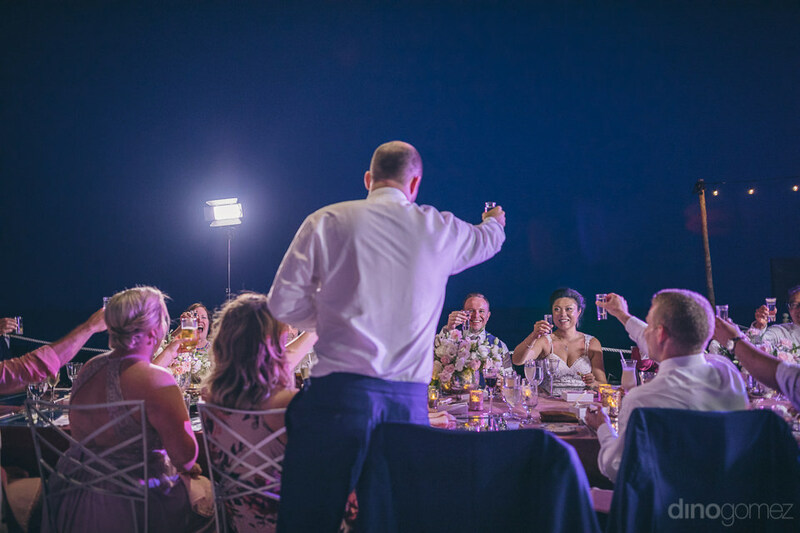 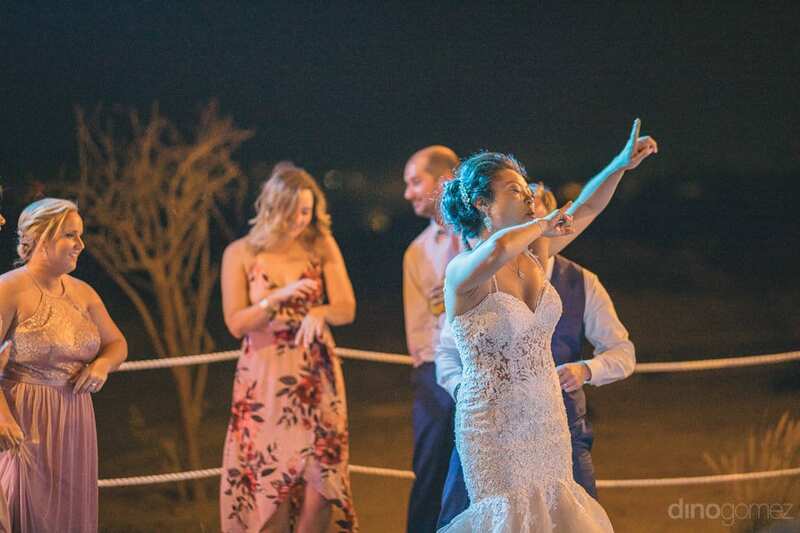 The lovely couple got married at Secret’s Peurto Los Cabos Resorts, Cabo San Lucas, Mexico, with 14 guests present to shower the couple with their blessings, well wishes and joy. 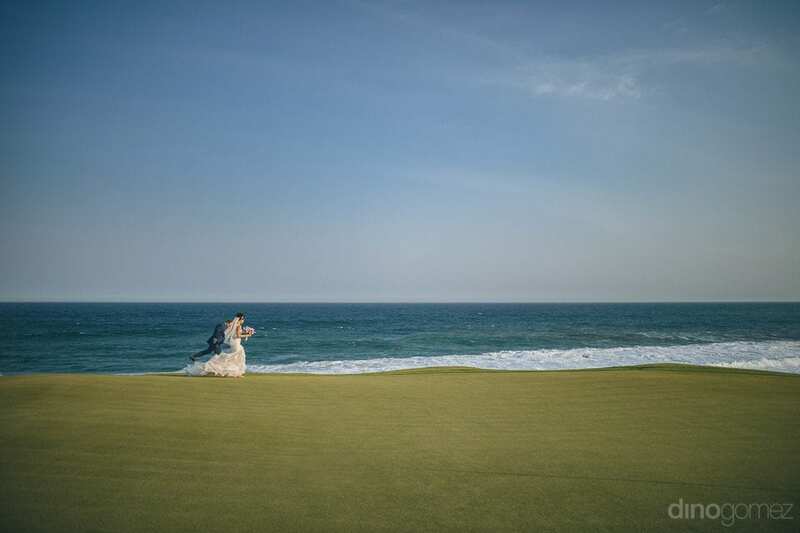 They had a Symbolic marriage, and as Jay better describes it as, beach set, formal, intimate and a romantic wedding. 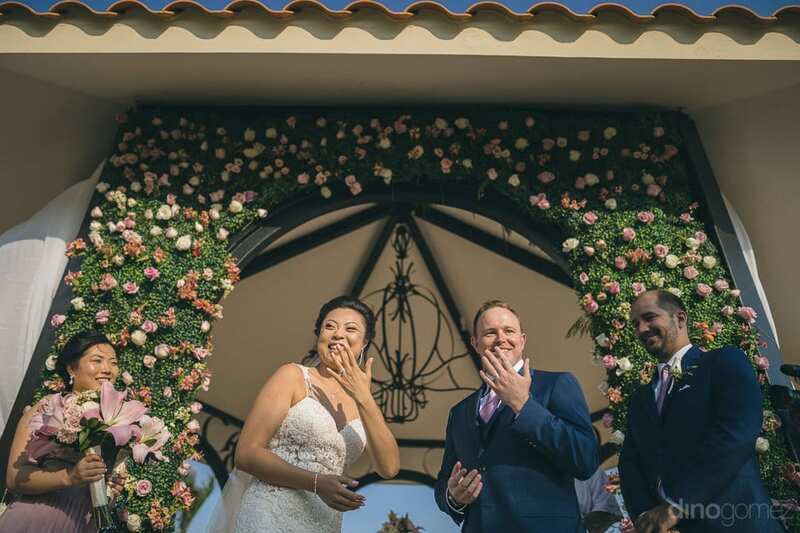 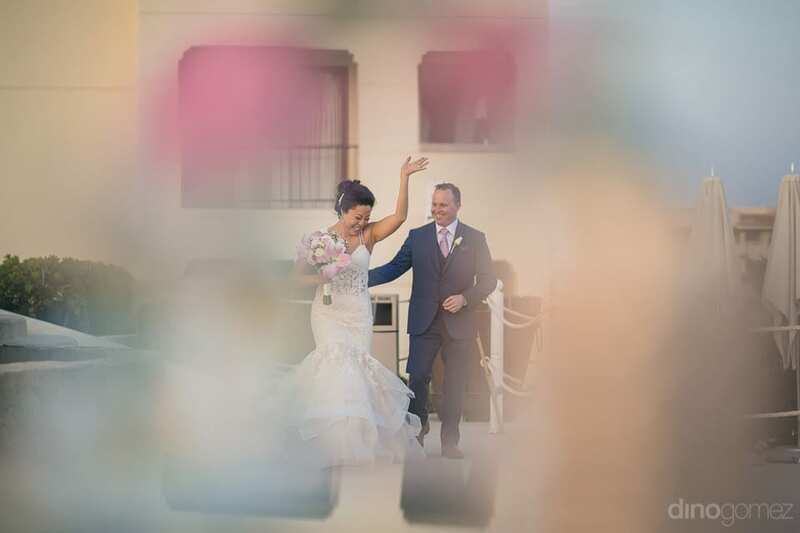 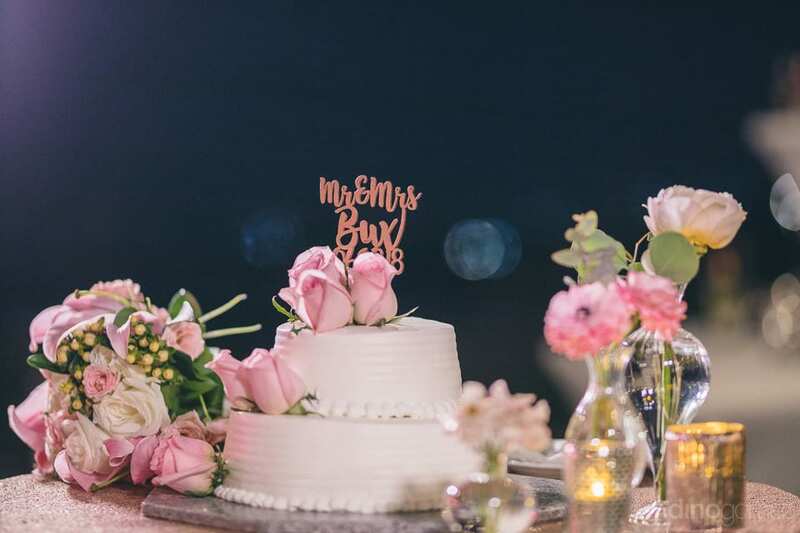 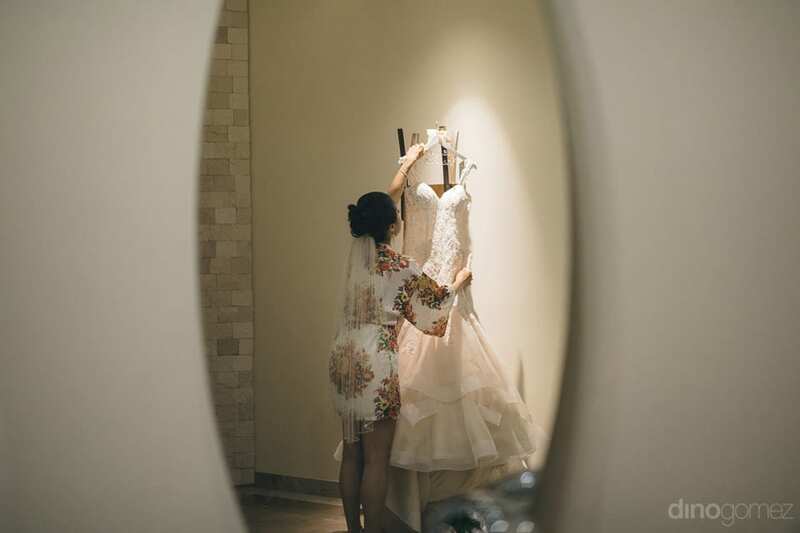 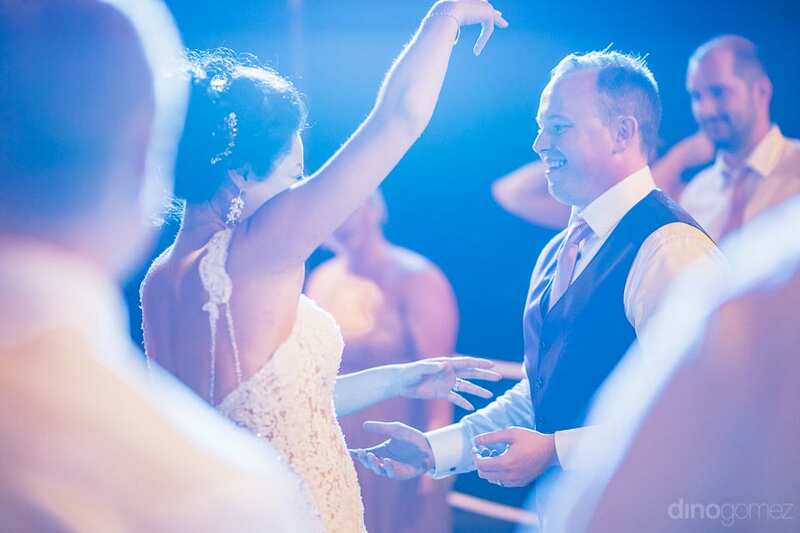 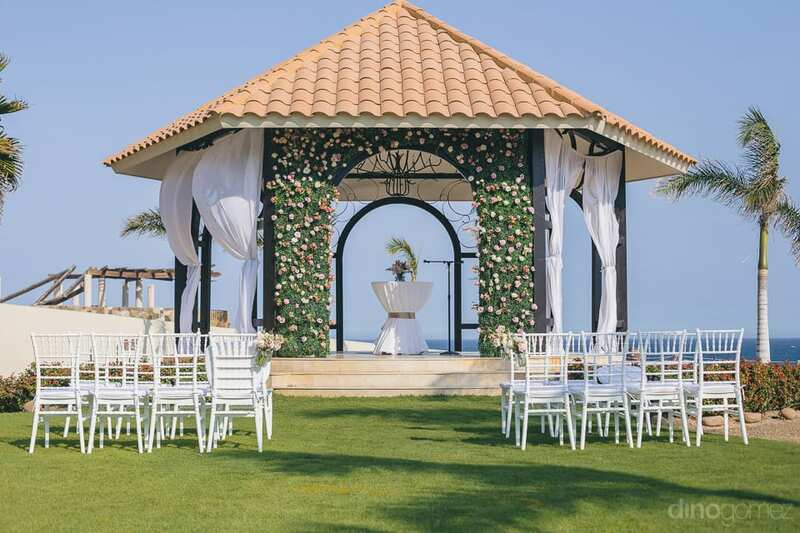 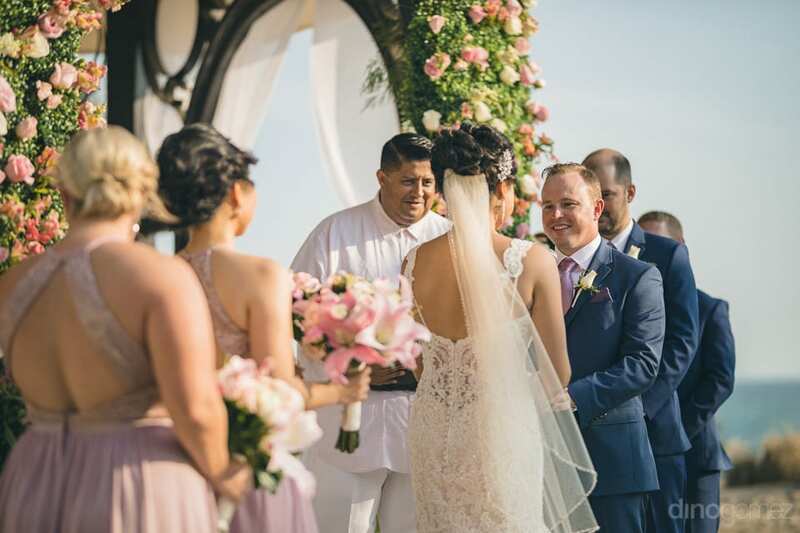 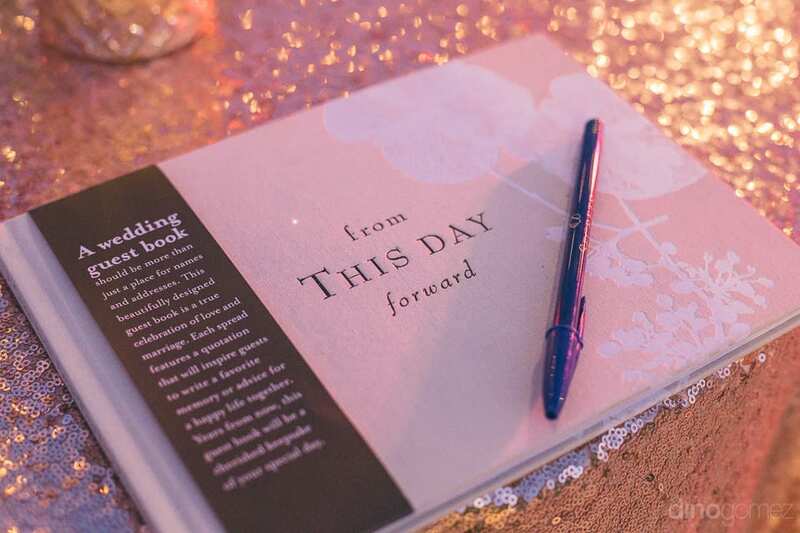 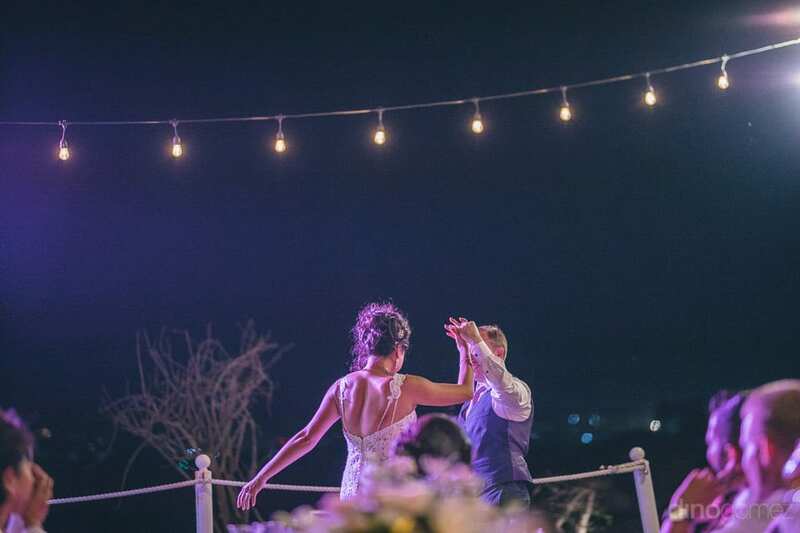 The wedding was well coordinated and managed in the able hands of one of the top Event Designer, Leslie Chavez at the luxurious Secrets Resort, Mexico. 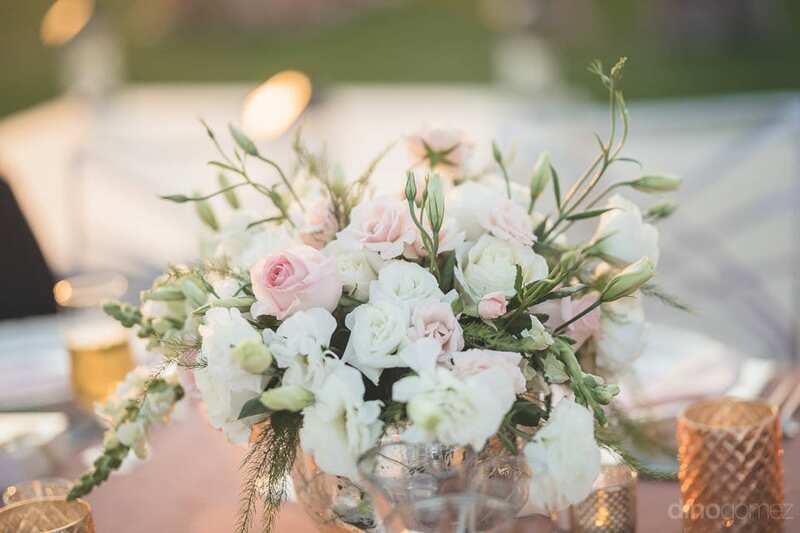 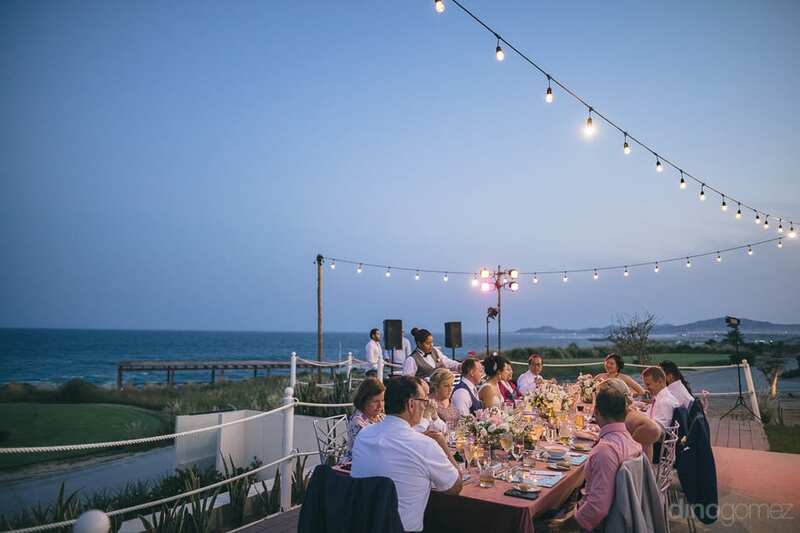 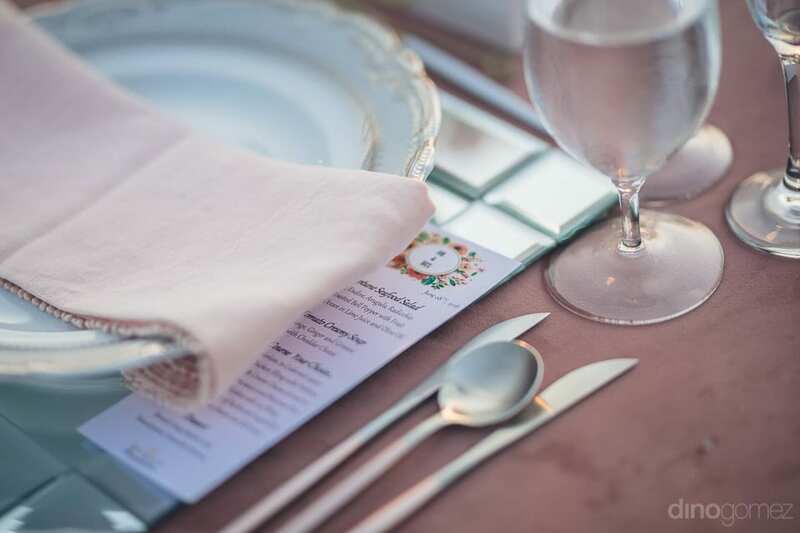 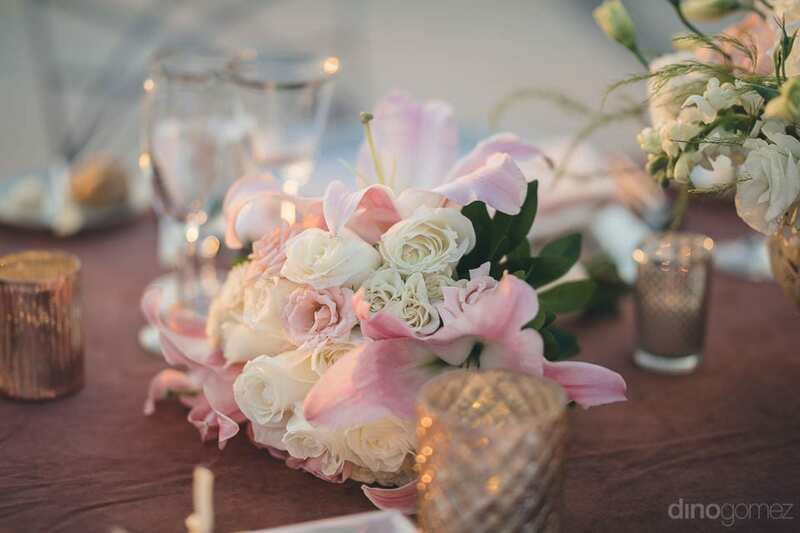 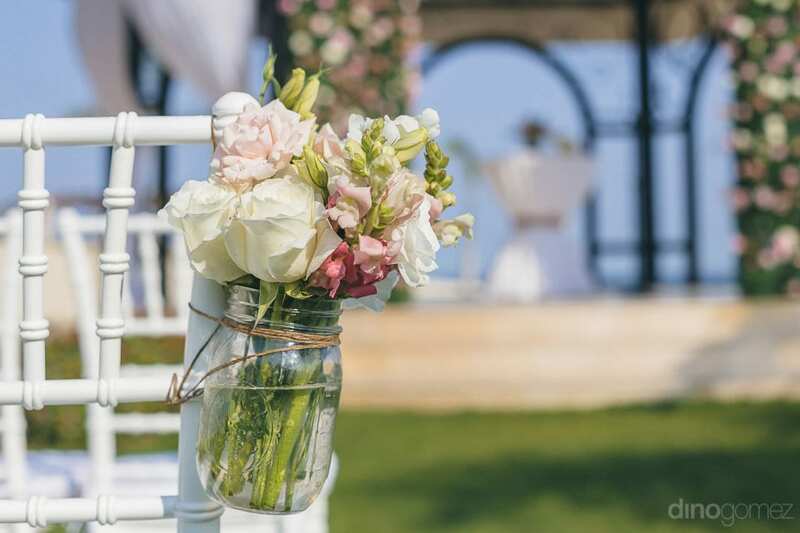 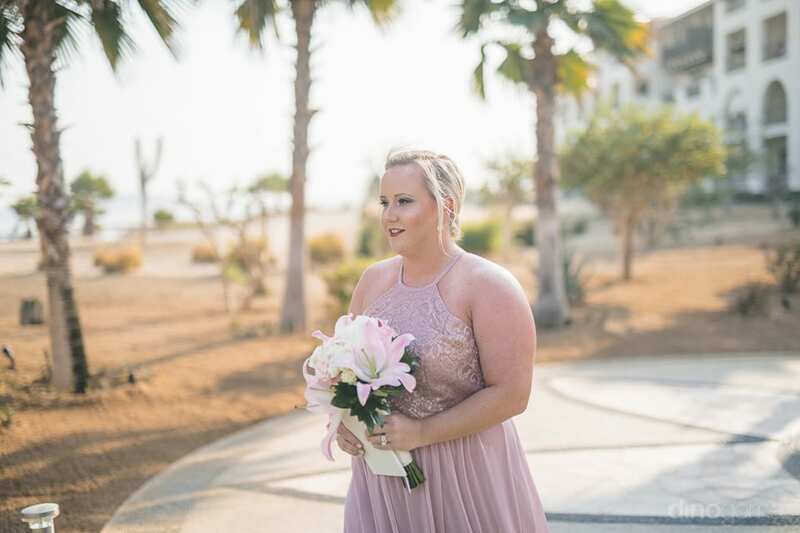 The décor was taken care of by the fantastic floral designer in Cabo, Flowers and Events Los Cabos, and the wonderful white chairs complementing the wedding decorations were amazingly provided by the Del Cabo Weddings. 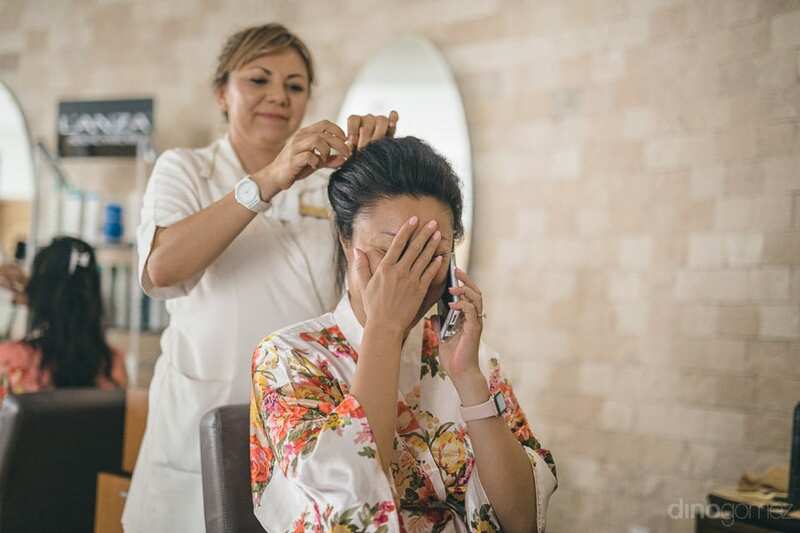 The bride looked amazing in her white wedding gown and with the perfect hairstyle and makeup. 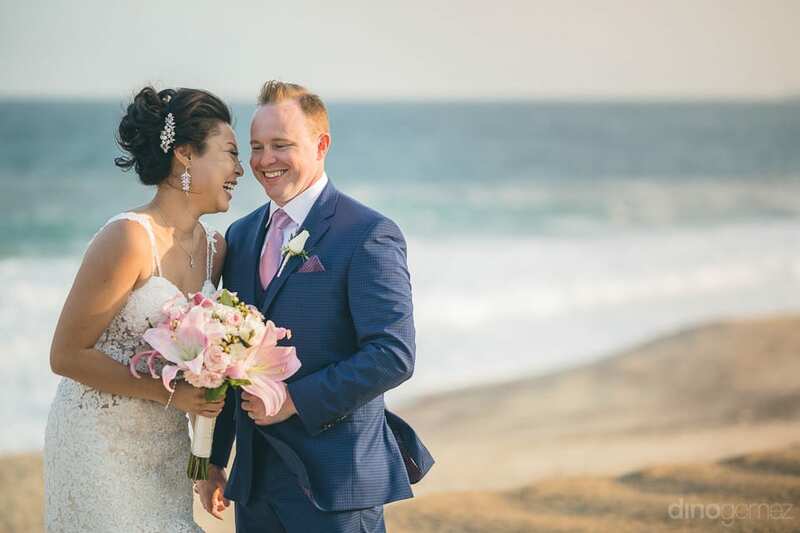 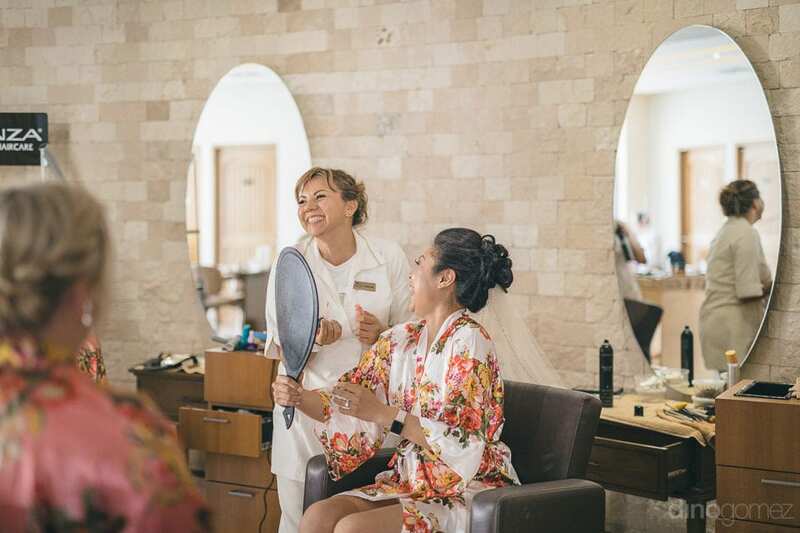 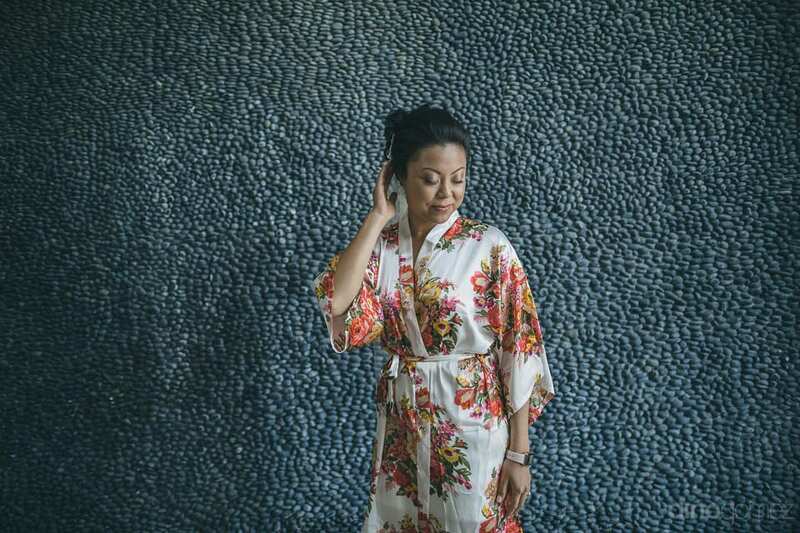 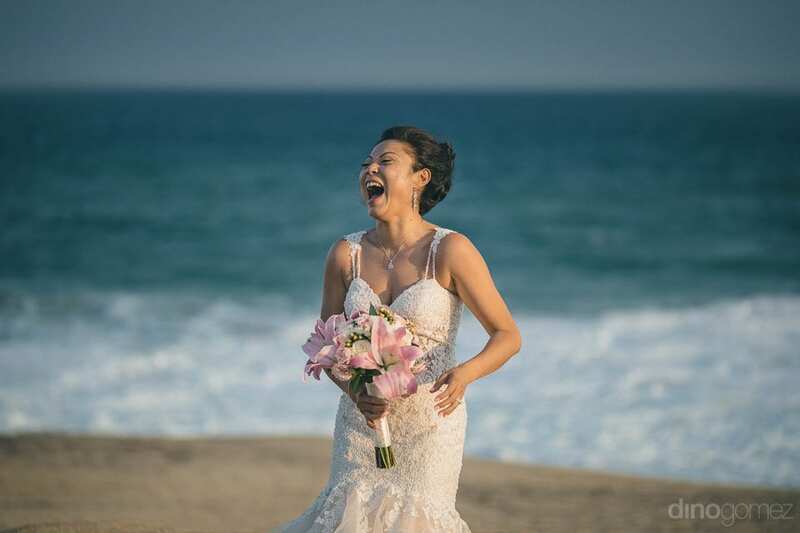 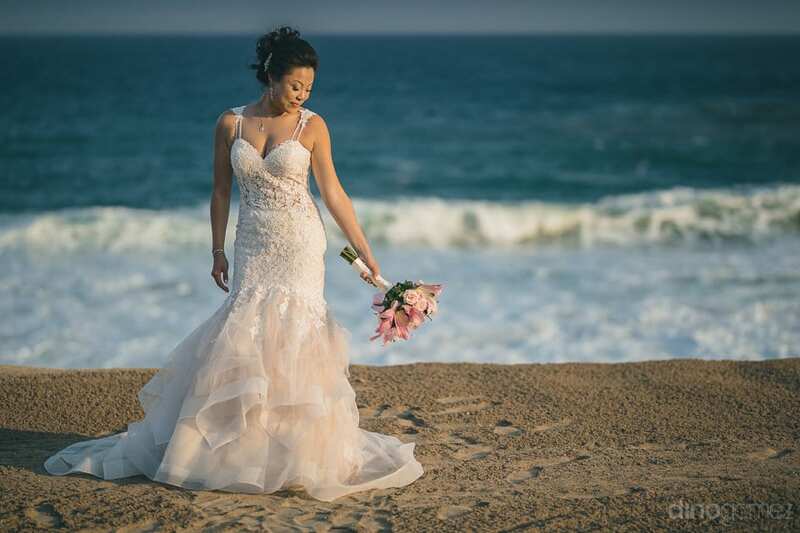 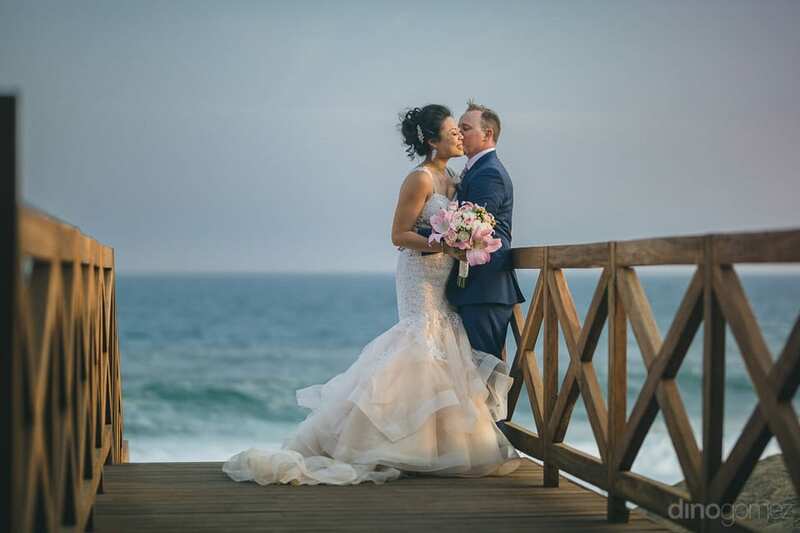 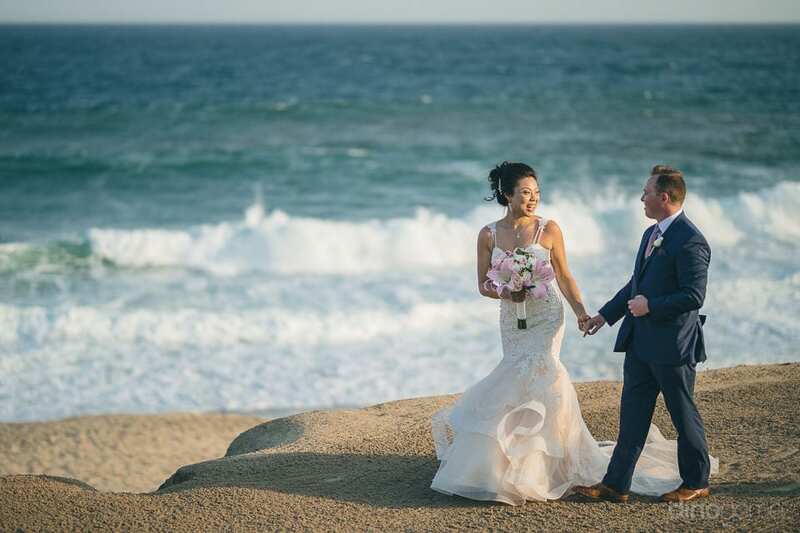 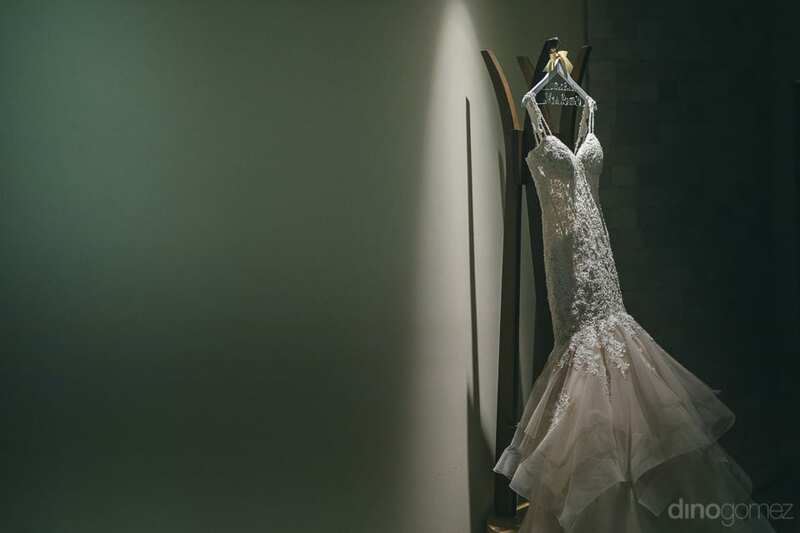 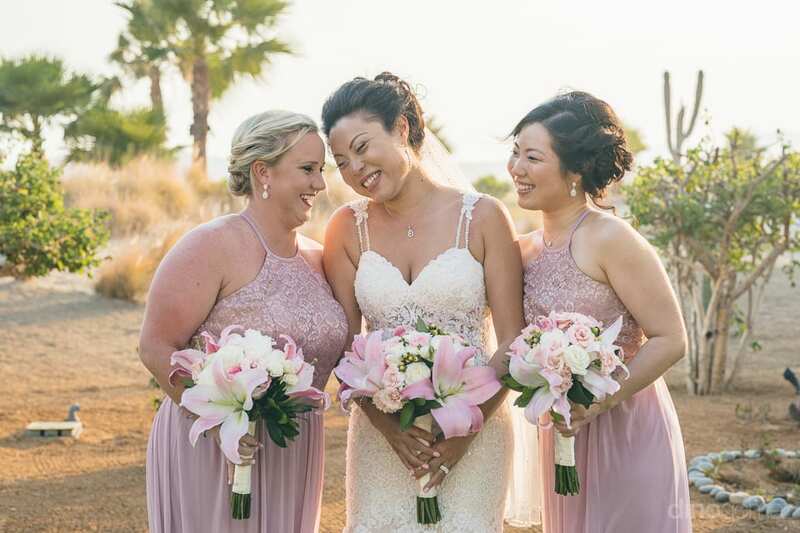 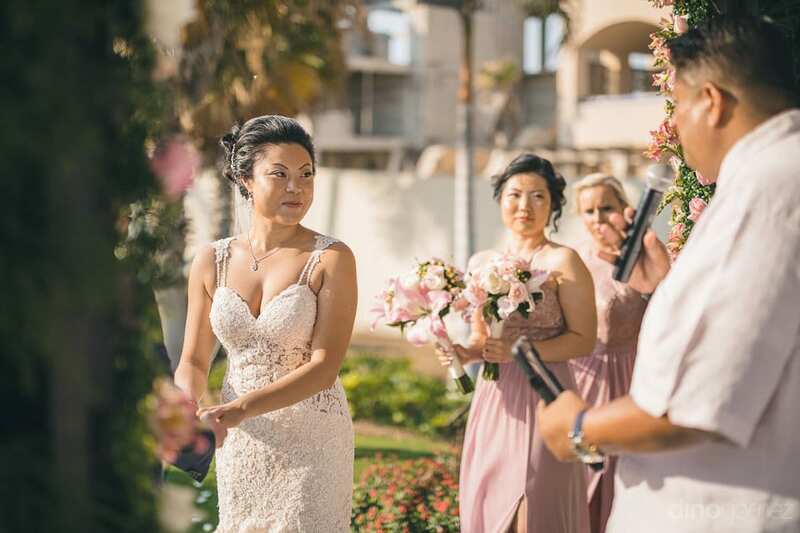 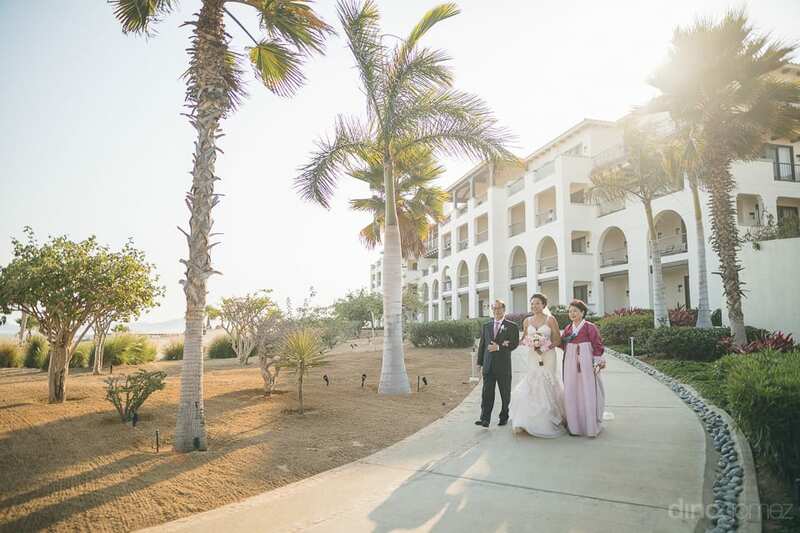 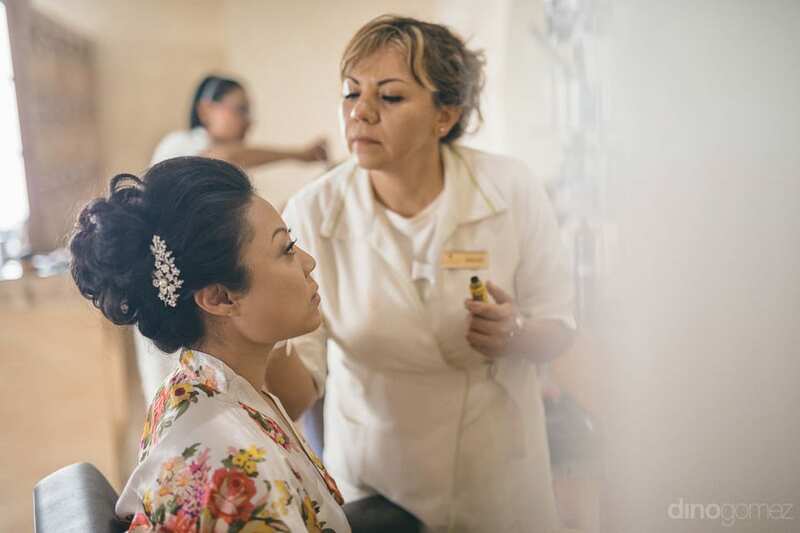 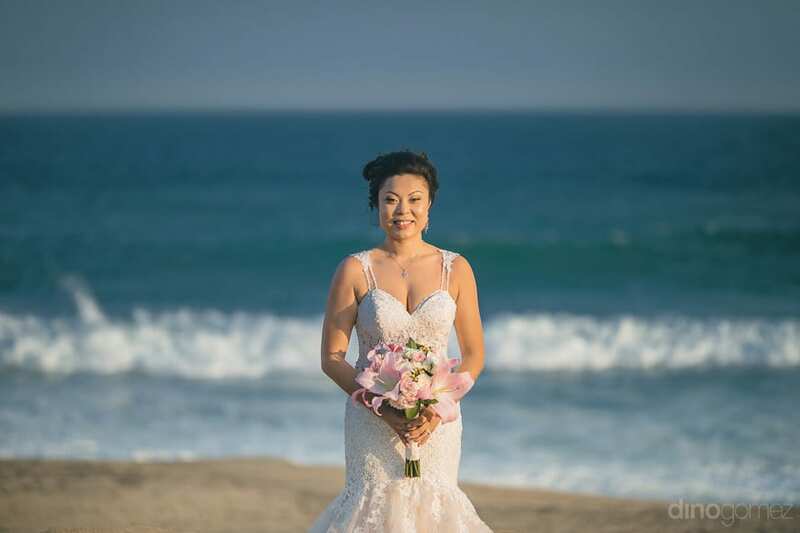 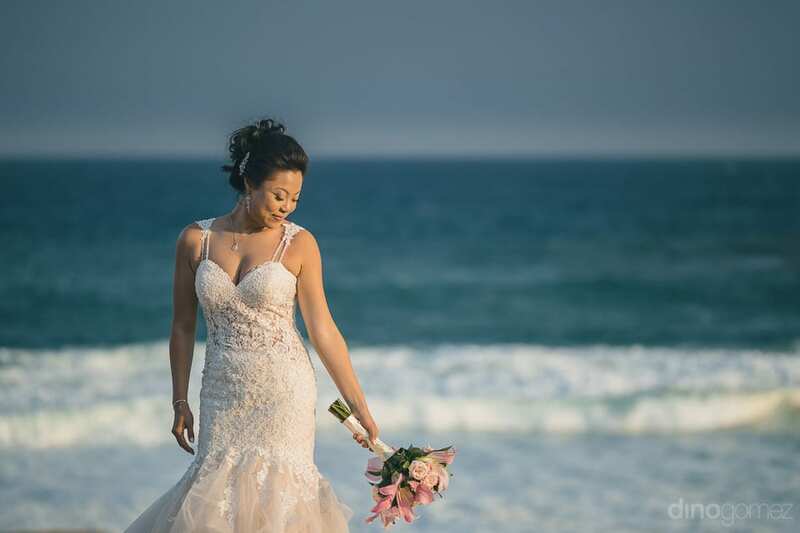 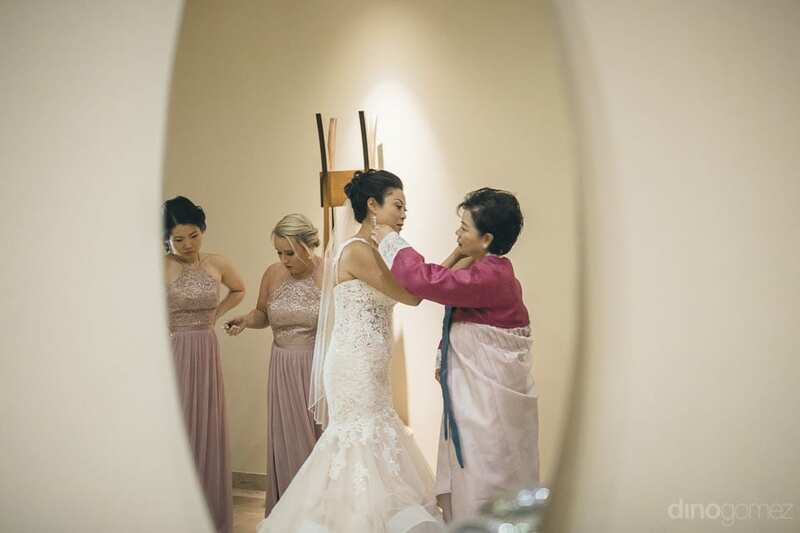 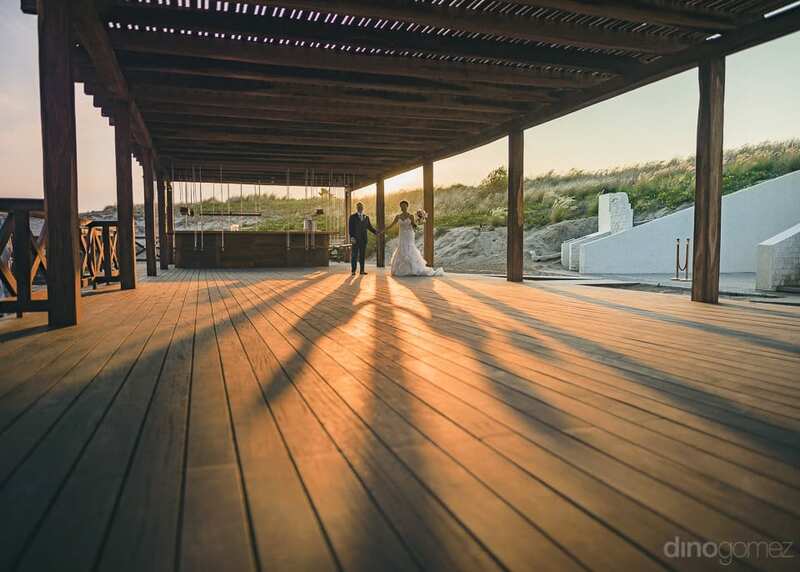 The bride chose the top makeup & hairstylist, Maryvy for doing her wedding makeup and got the lovely wedding moments captured by the destination wedding photographer, Dino Gomez based in Cabo. 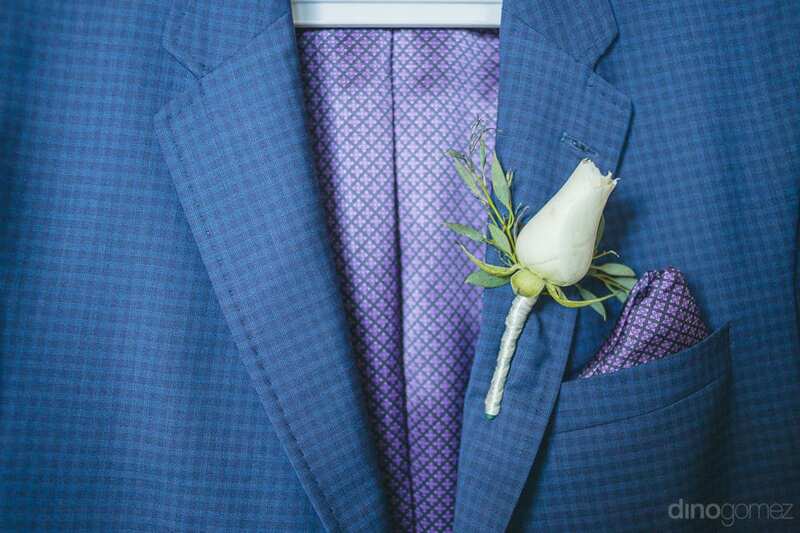 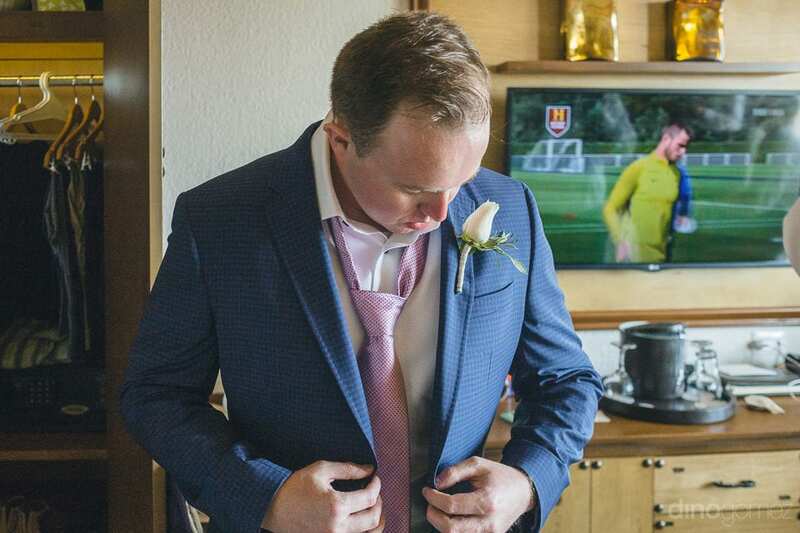 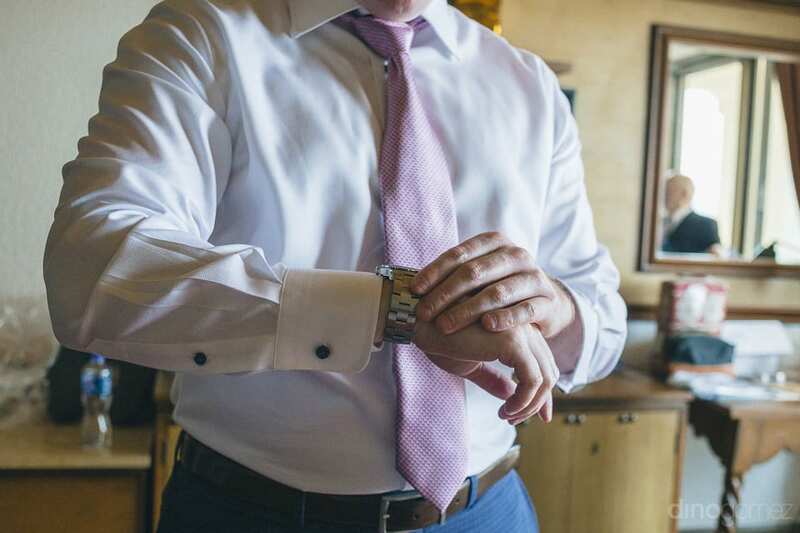 And, the groom wore a checkered suit complimenting the bride’s dress. 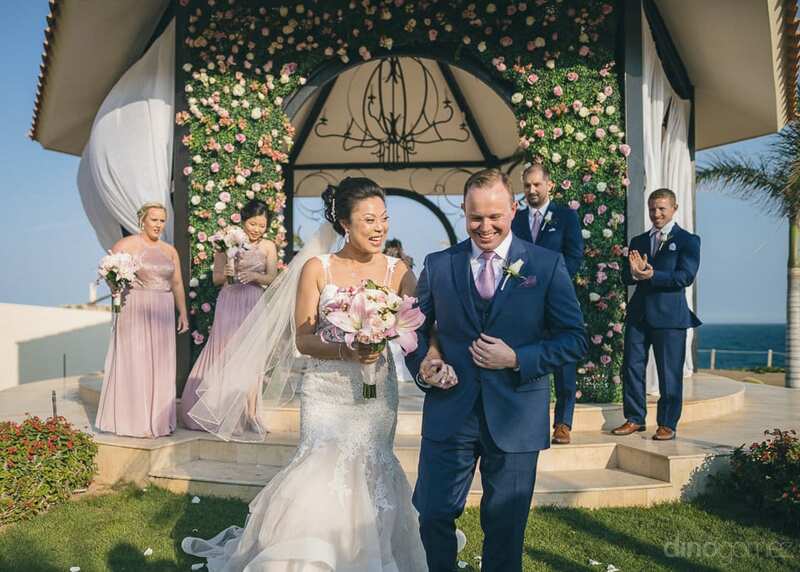 The couple looked divine standing together on their wedding day. 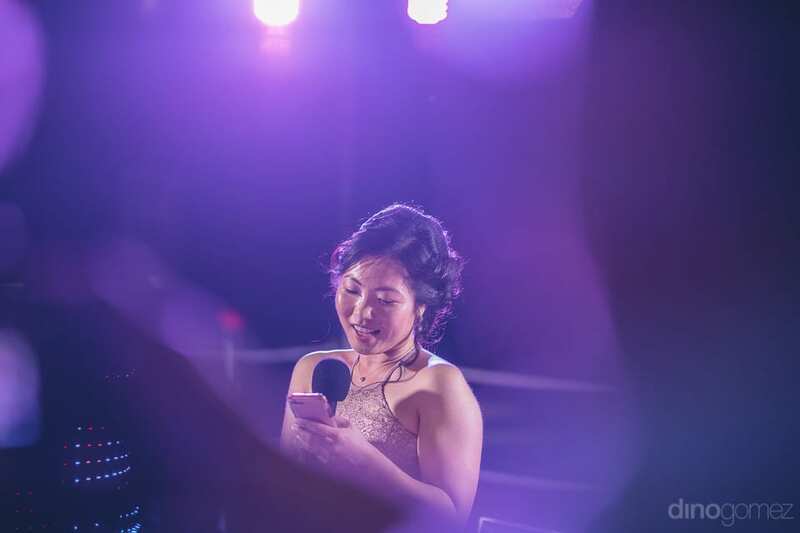 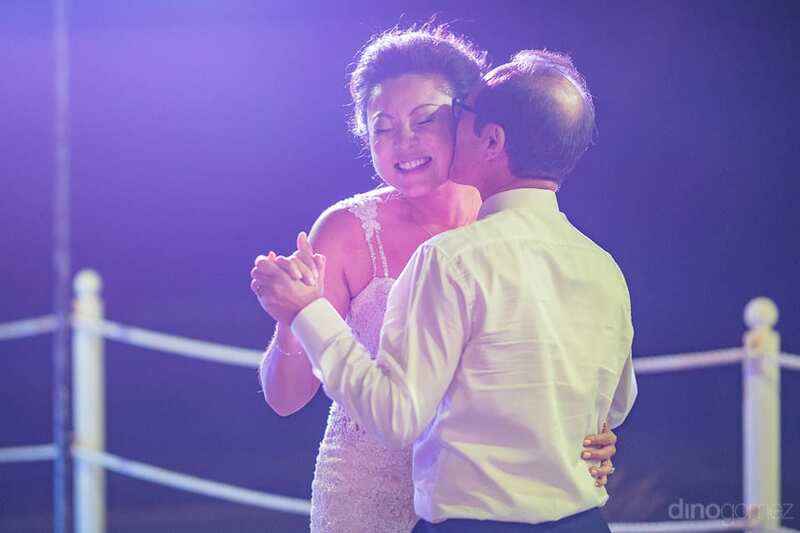 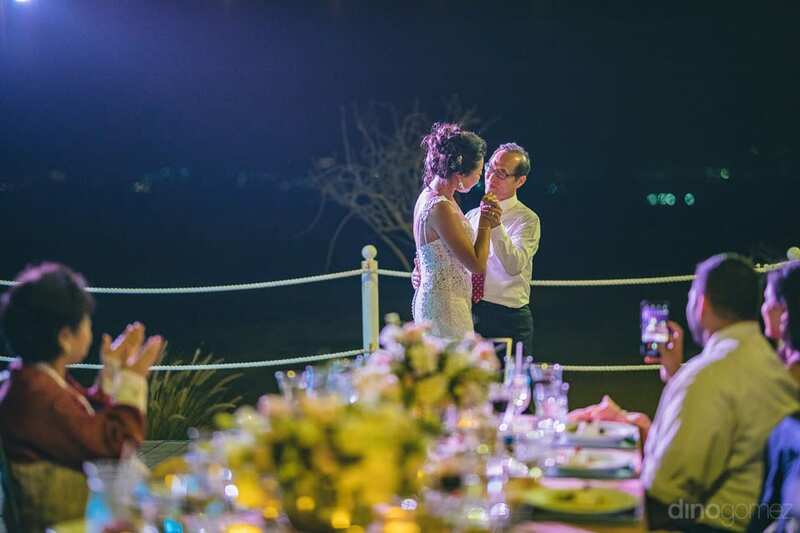 After the successful completion of wedding, couple hosted an evening reception party for the guests at the romantic Oceana Deck, Secrets Resort. 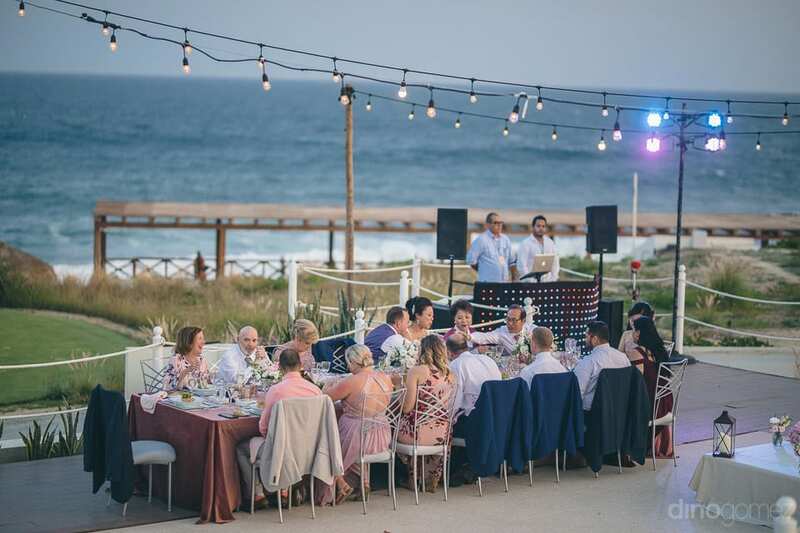 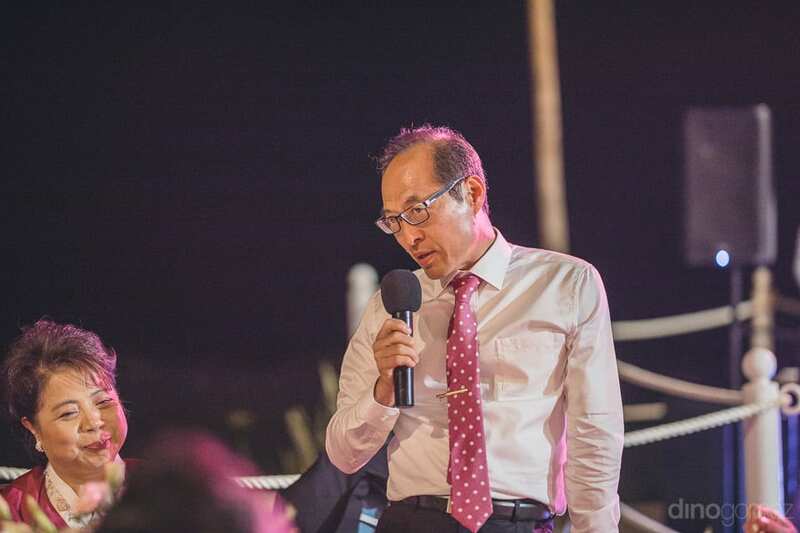 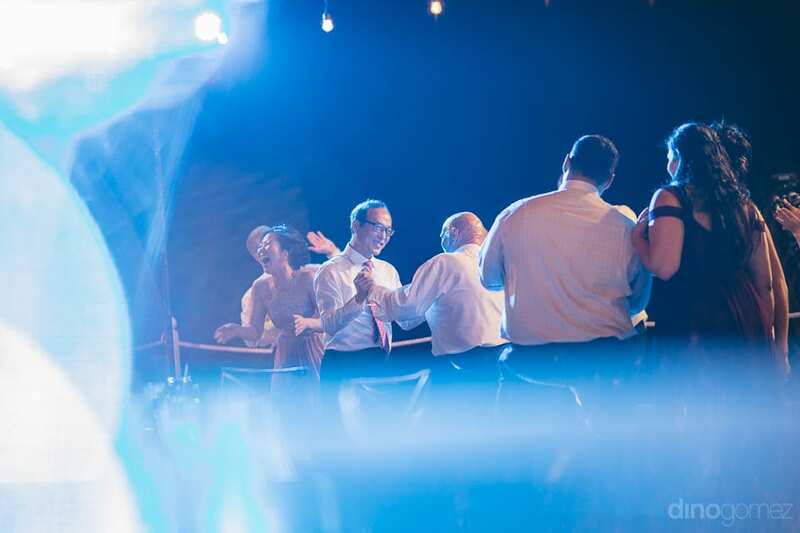 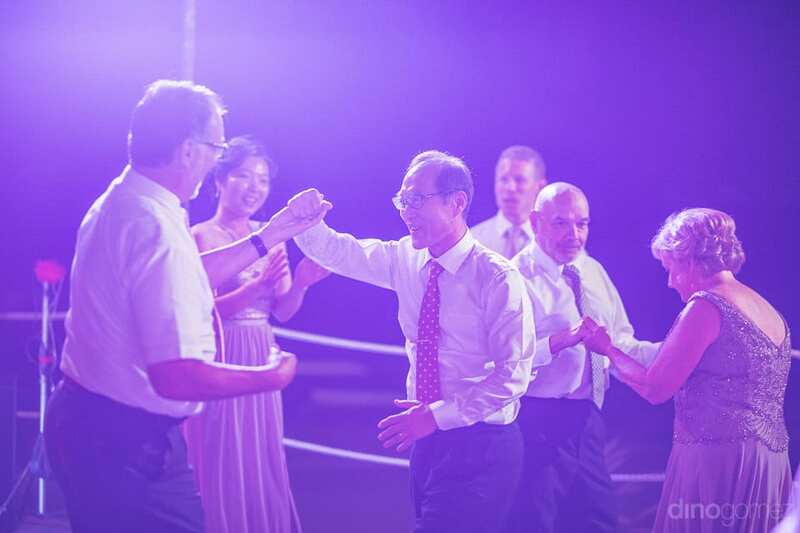 It was a wonderful party near the sea and everybody grooved on the beats of music given by the famous music providers Encore Event Technologies based in Los Cabo. 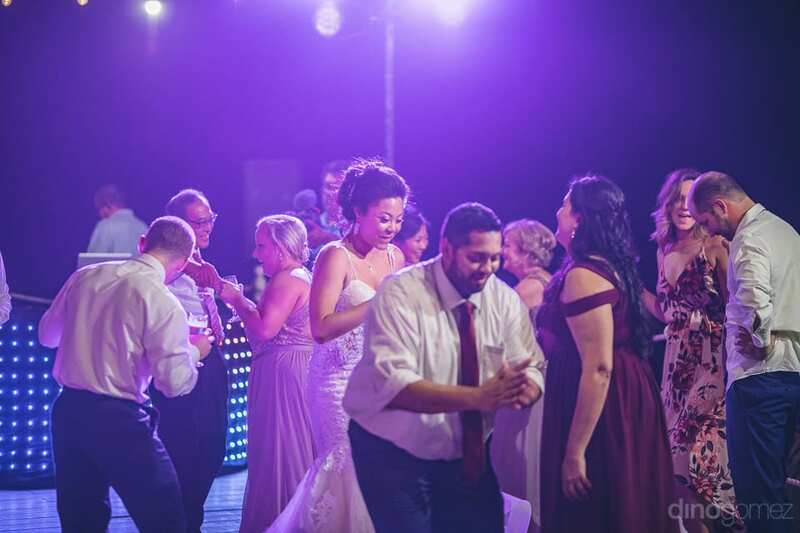 It was a fun-filled reception party of the lovely newly married couple. 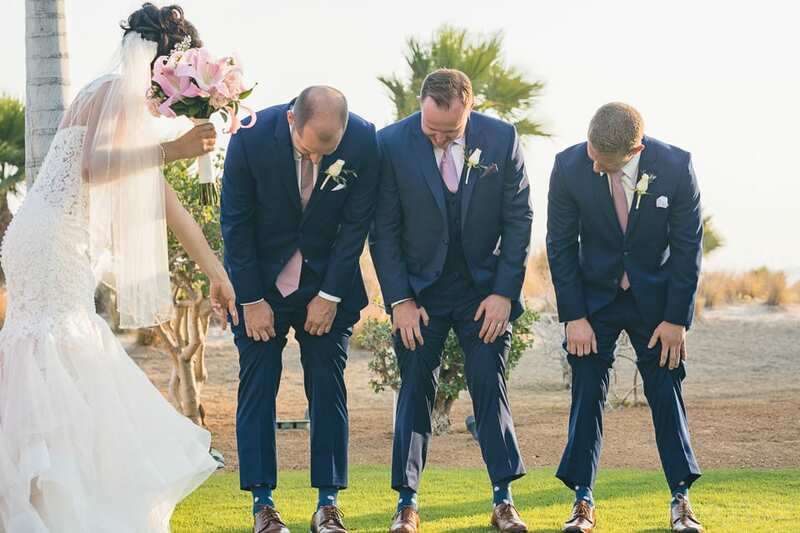 These sweethearts are also huge dog people. 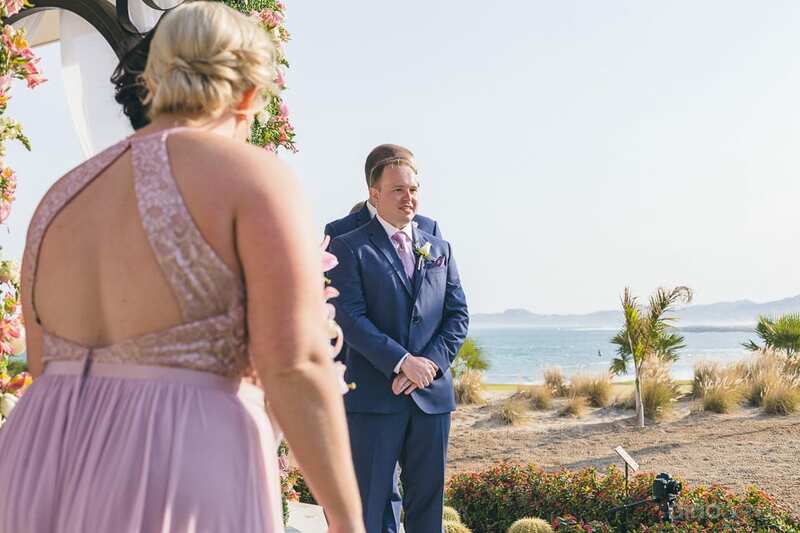 They have a mini poodle named Benny who is very close to both of them. 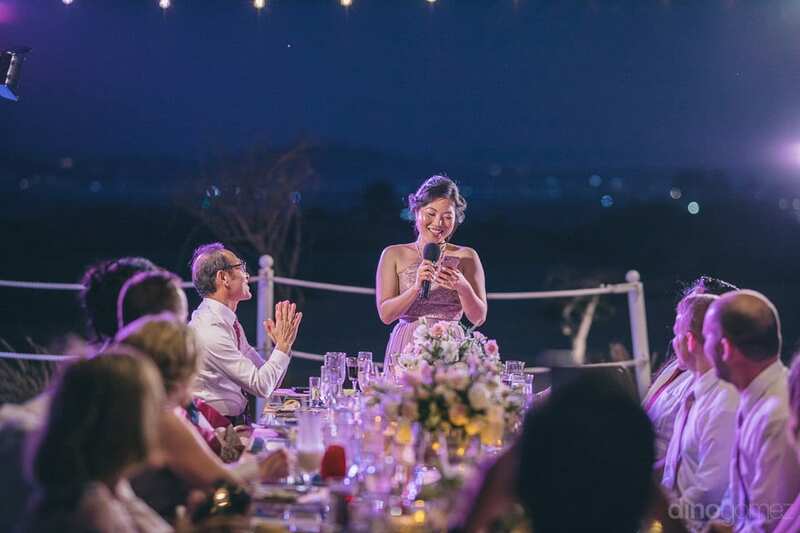 Jay believes him to have been a blessing in their relationship so far & has made them capable of even being good parents in future. 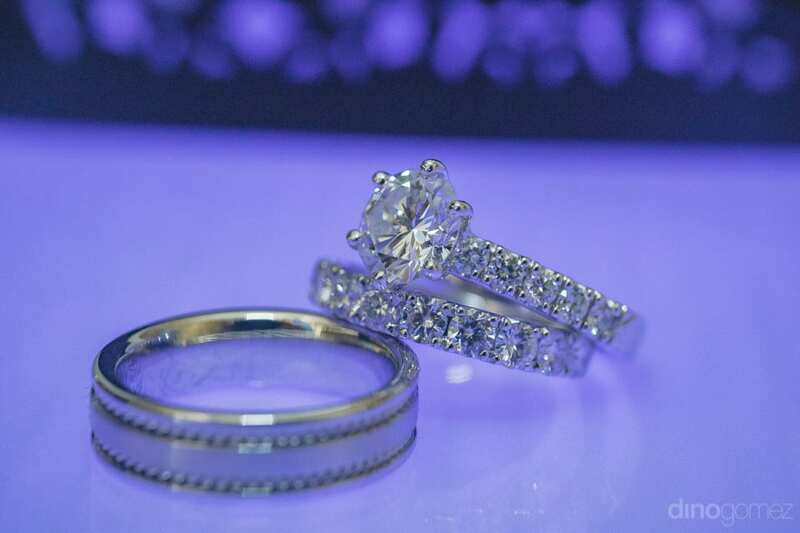 As a couple, they look forward to having a loving and happy family and working hard for the same. 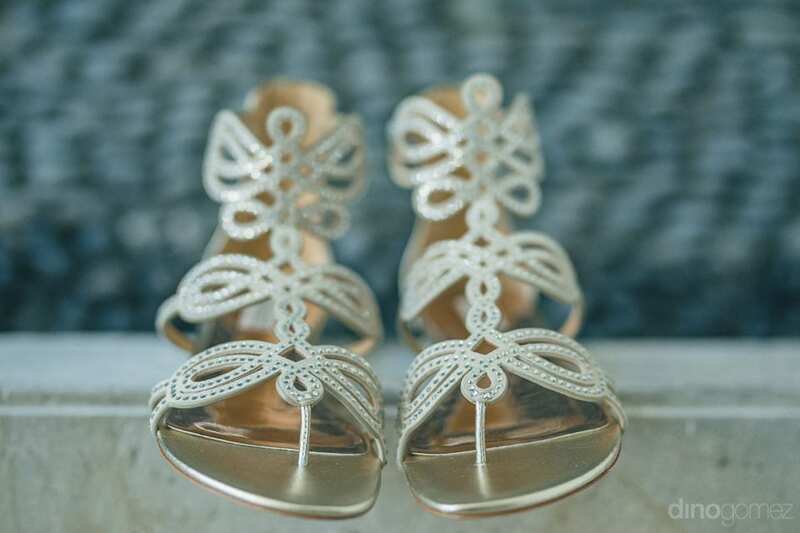 They want to give opportunities to their kids to grow up with all what they desire. 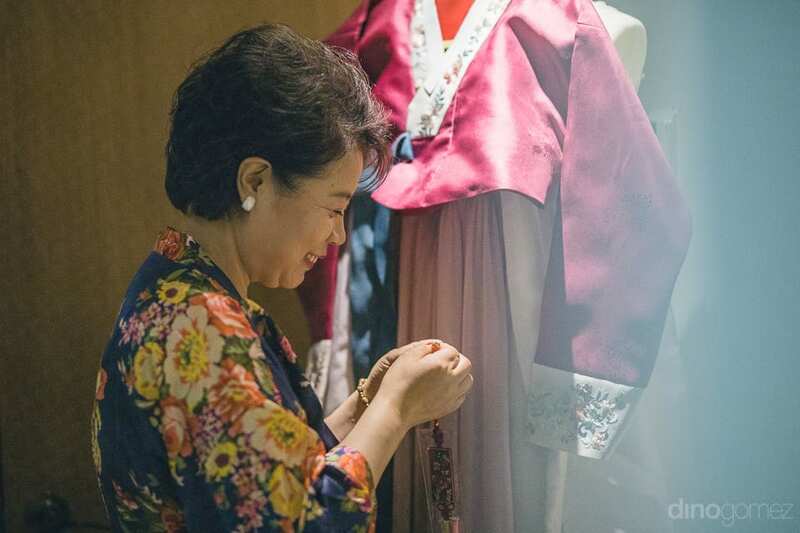 In fact, what inspires them in life is enjoying littlest things in life, and knowing how grateful they are to be where they are today. 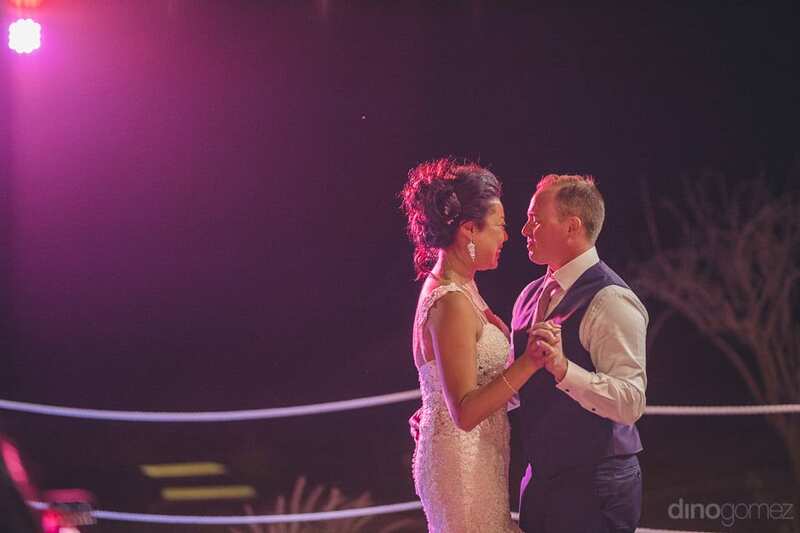 It was a lovely experience capturing the wedding moments of this lovely couple for a lifetime for me.